BSA G14 - Мотомир Вячеслава Шеянова | This work is licensed under a Creative Commons Attribution-NonCommercial-NoDerivatives 4.0 International License. 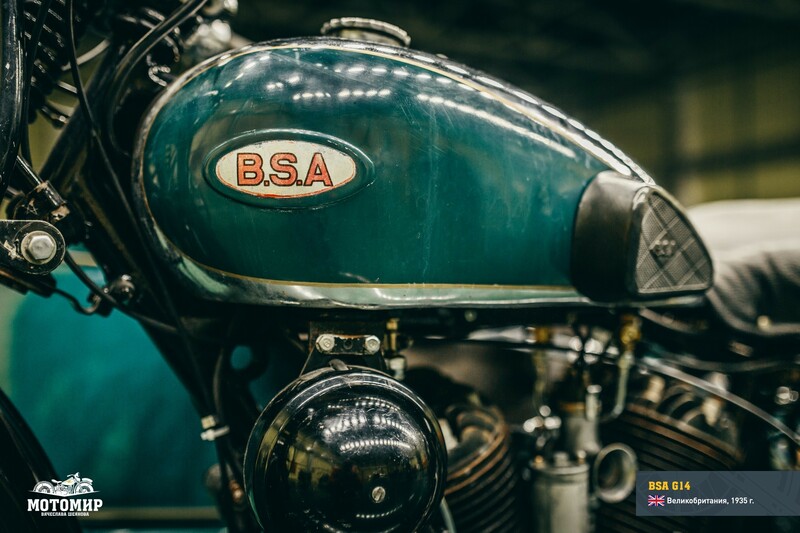 BSA, a company from Birmingham, made its first motorcycle with an L-head, V-shape engine in 1919. 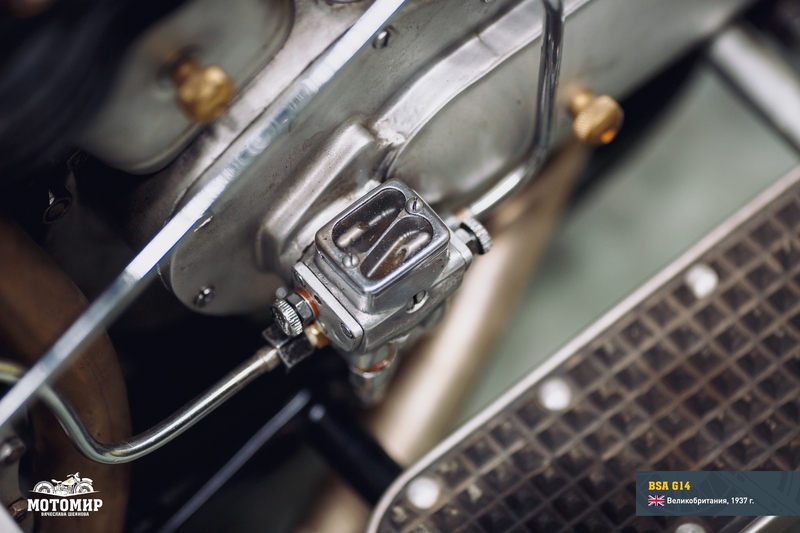 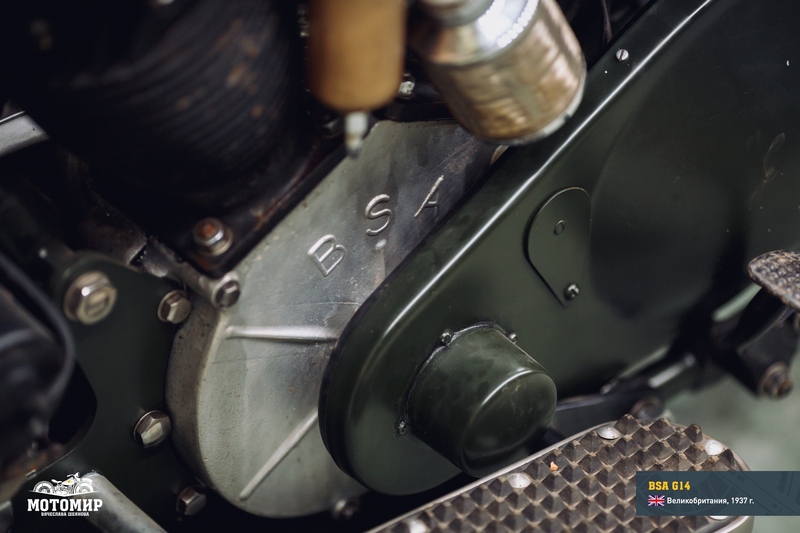 It was a 770-cc model E. In 1922 the company also went into commercial production of a 986-cc motorcycle which received index F and, after the upgrade in 1924, index G. Before 1936 the BSA motorcycle models had a double digit index that would change every year, and after 1936, as a next model range was coming to production, each machine got its own name. 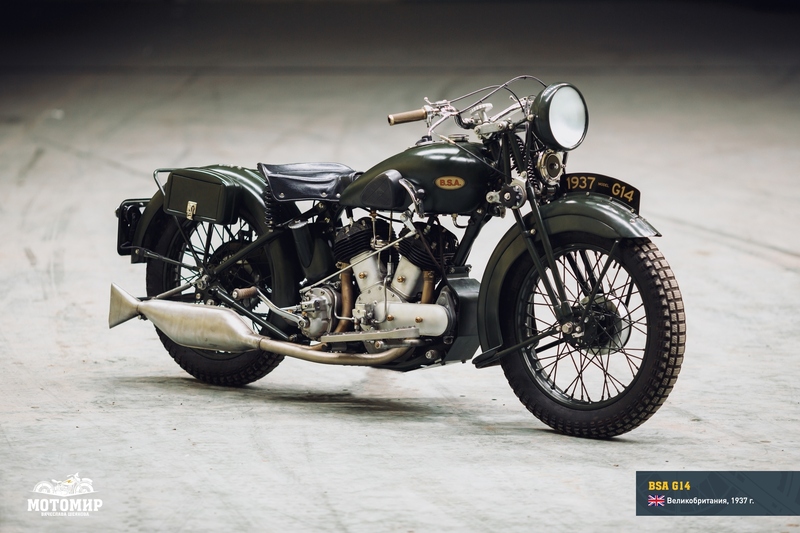 Thus heavy motorcycles of model G had at first indexes like G 30-16 or G 34-14 and after 1936 they were simply called G 14. 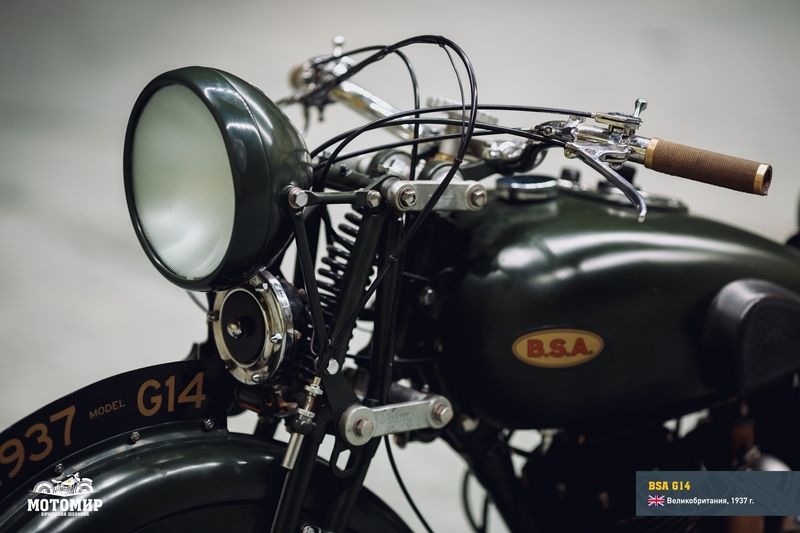 Thus, even though the history of BSA G14 started in 1936, its heritage was as long as from early 1920s. 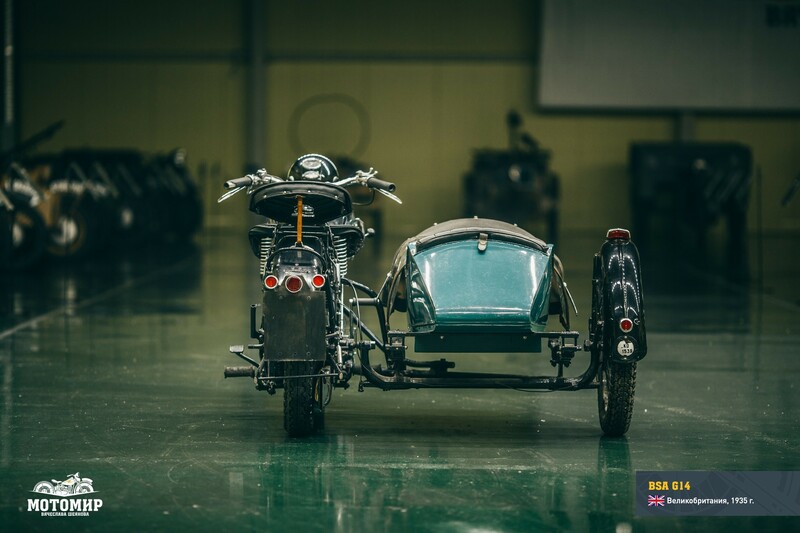 Despite the fact that G14 was supplied in its solo version, its main task was to act as a workhorse that is to transport heavy loads in the sidecar. 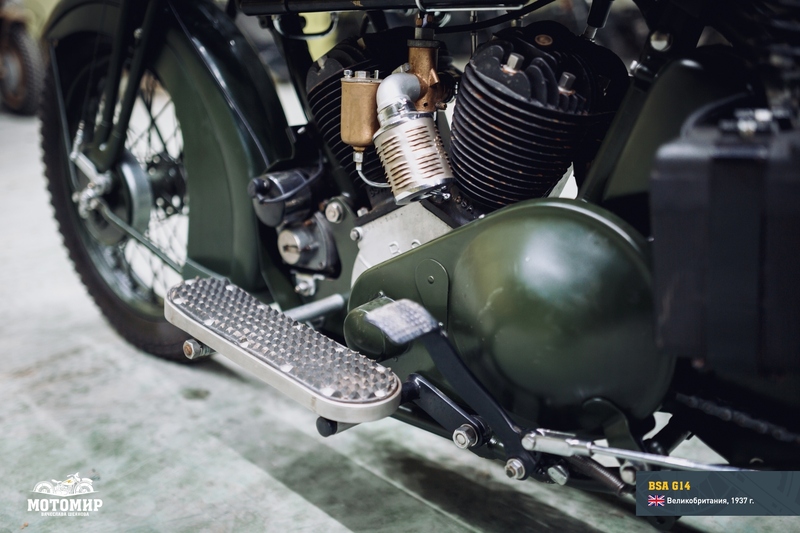 The powerful engine was providing comfortable riding conditions for the driver, even across a rough terrain. 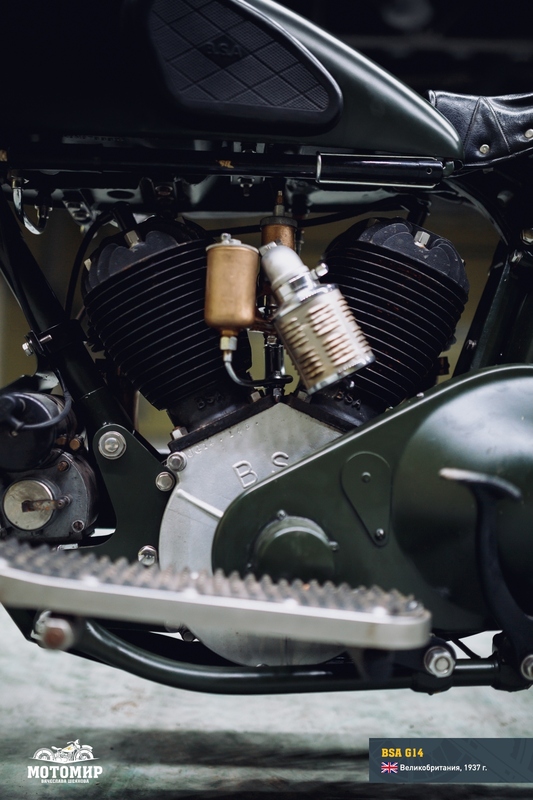 In the 1930s motorcycles like the G14 were not counted, of course, as belonging to cruiser category, even though it had, from today’s viewpoint, all relevant characteristics: additional torsion torque (that was achieved, among other things, due to flywheels), a long wheelbase, a retorted steering wheel, large tires, a lot of chrome and a low seat. 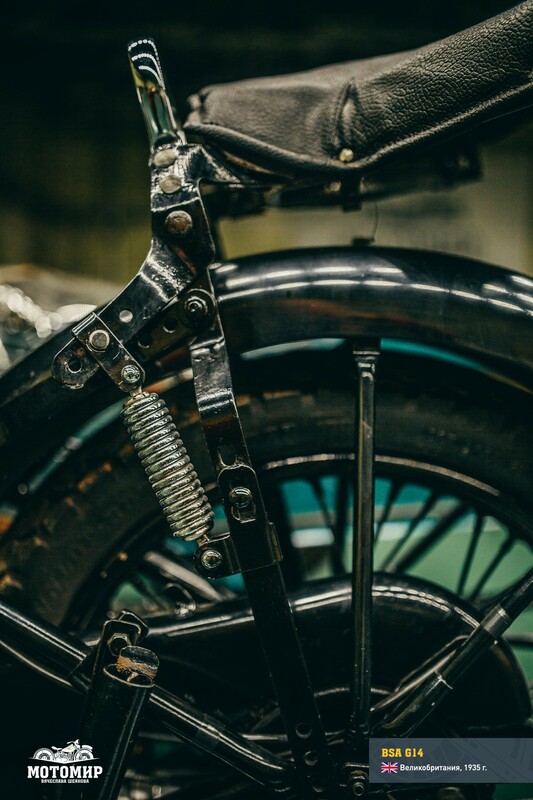 The frame of G14 was very special. 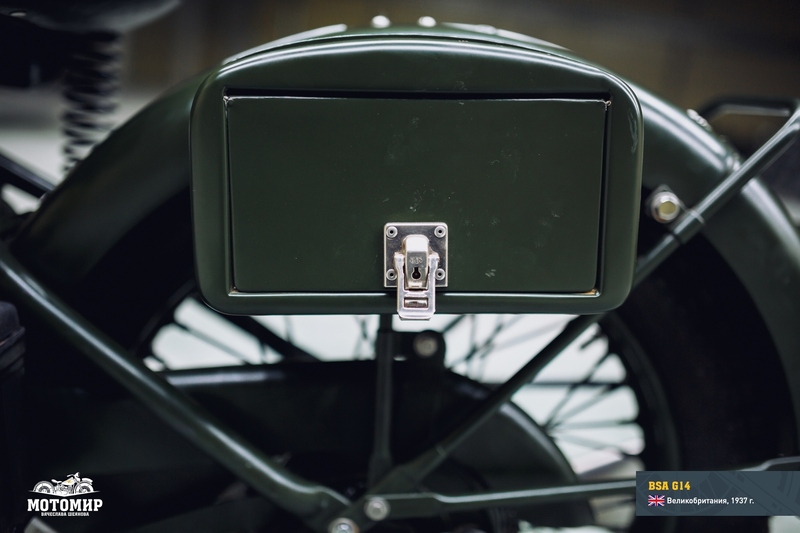 Its base was made of forged steel and had impressive 16 kg of weight. 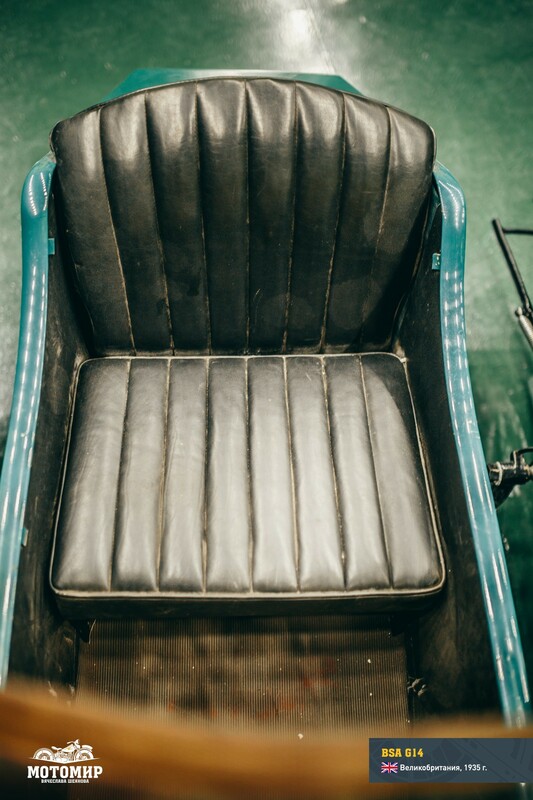 The top part and the seat part of the frame were also forged. 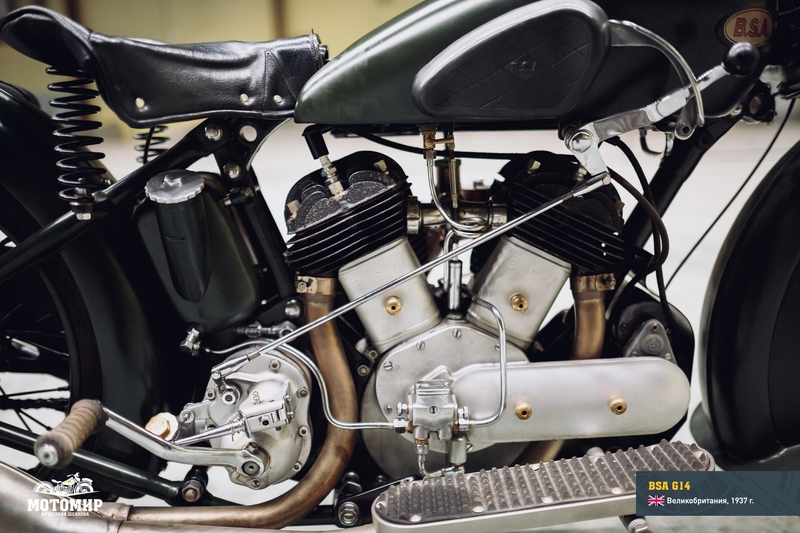 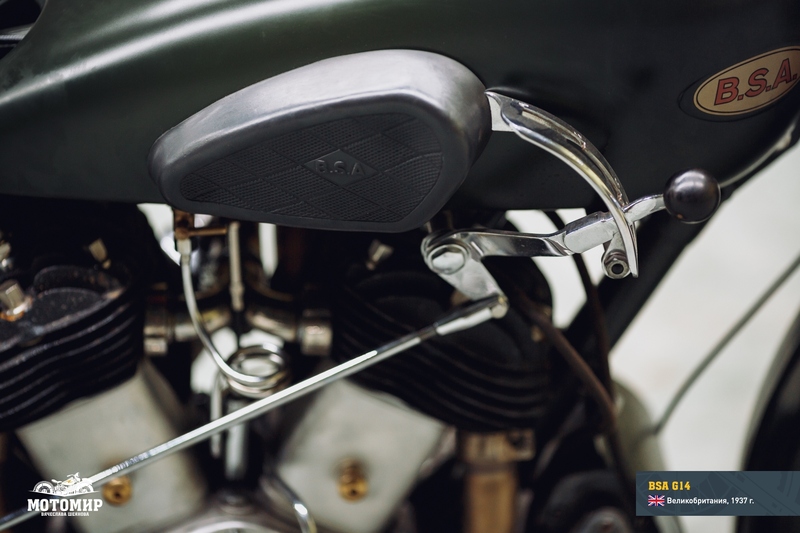 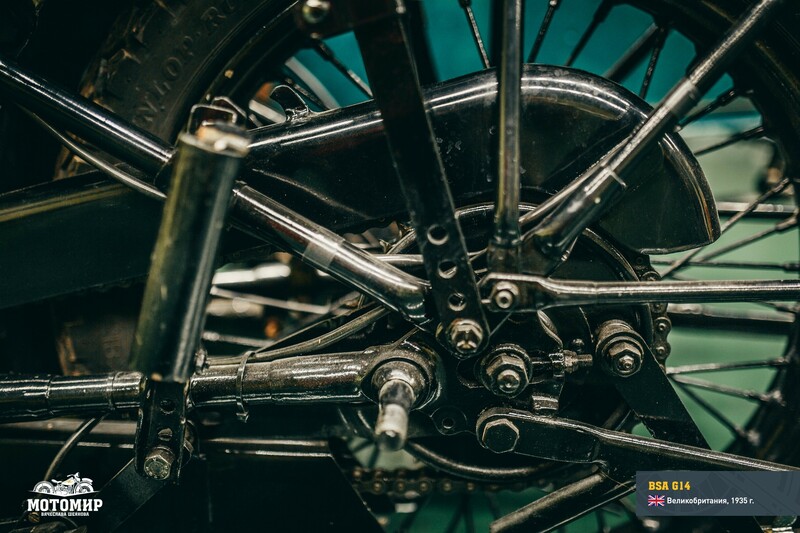 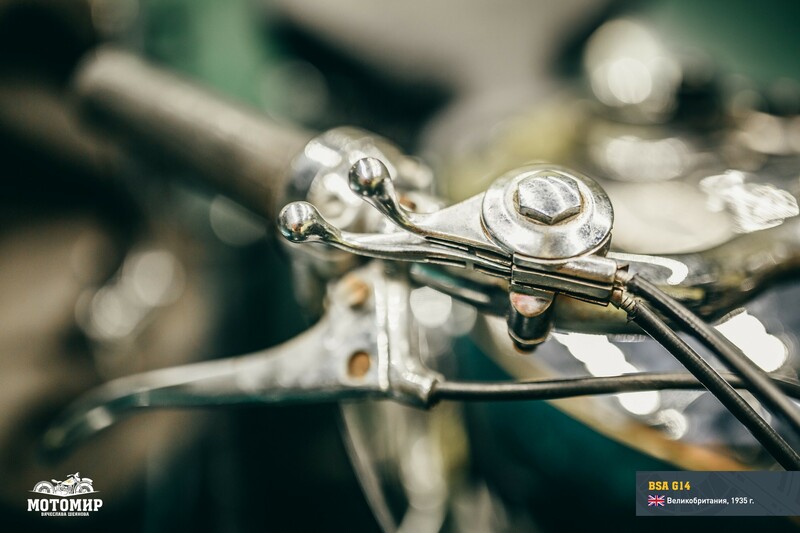 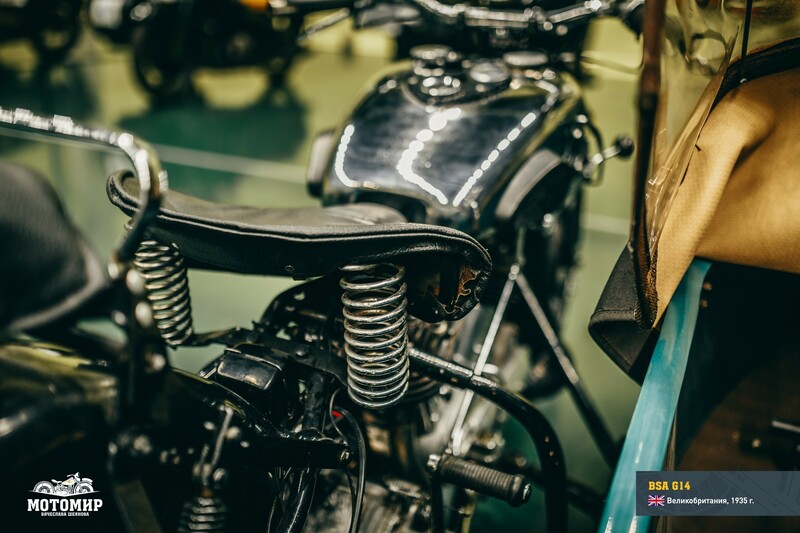 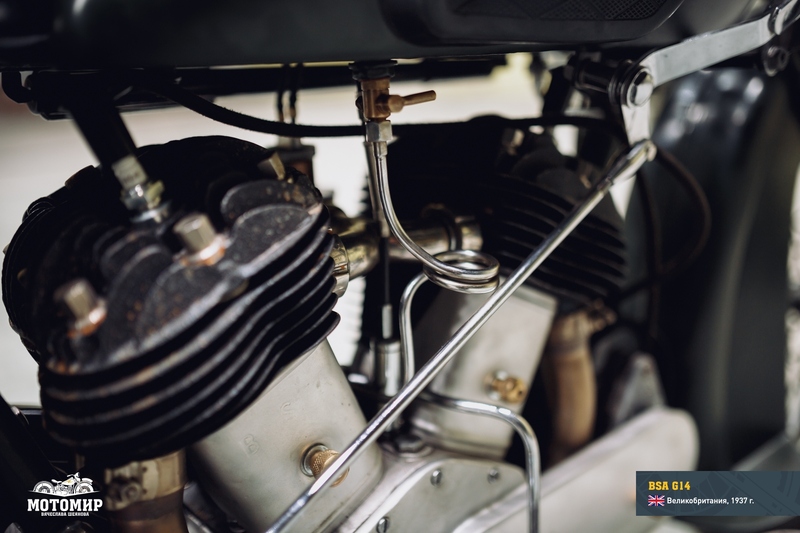 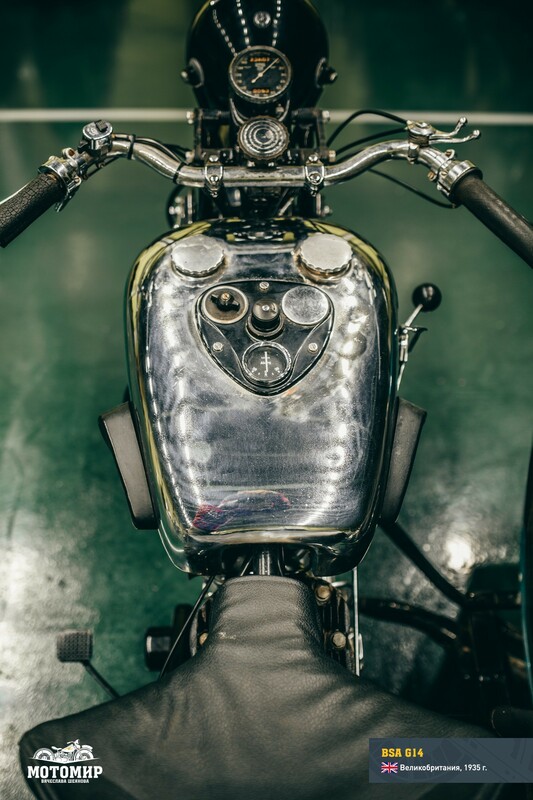 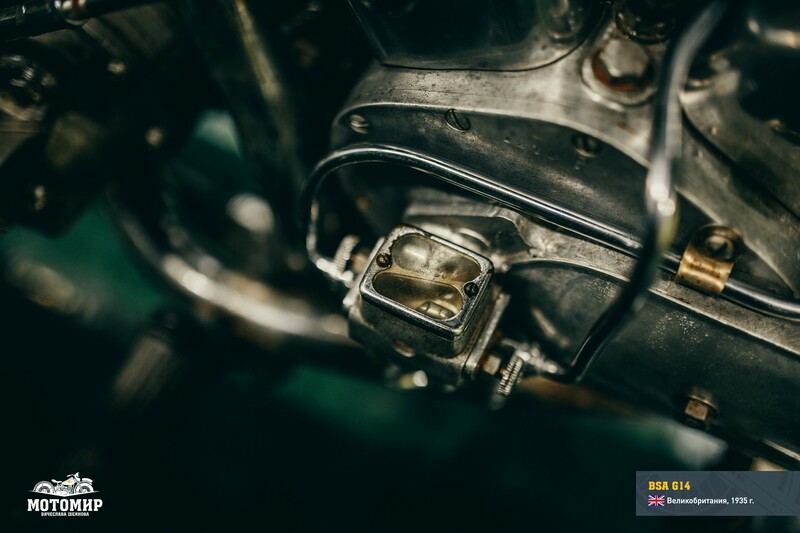  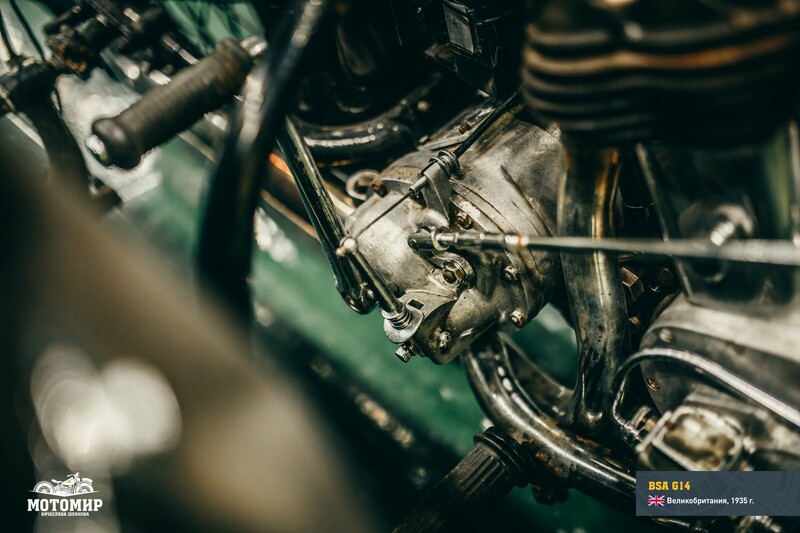 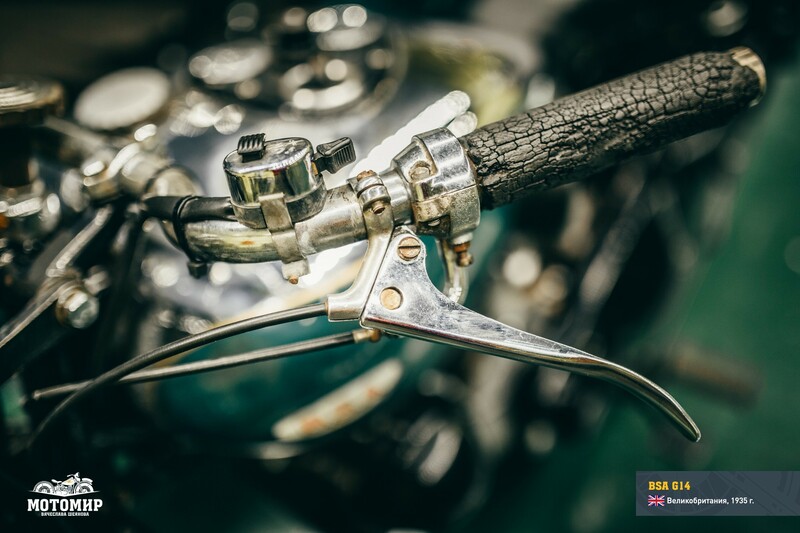 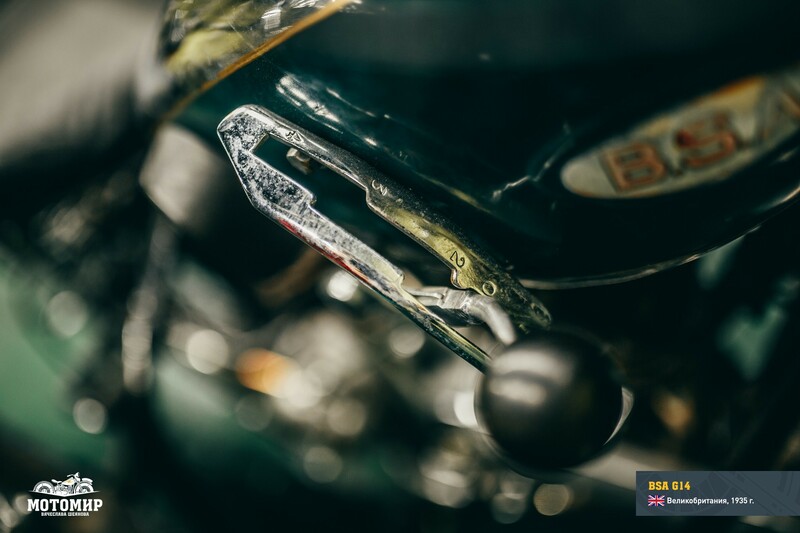 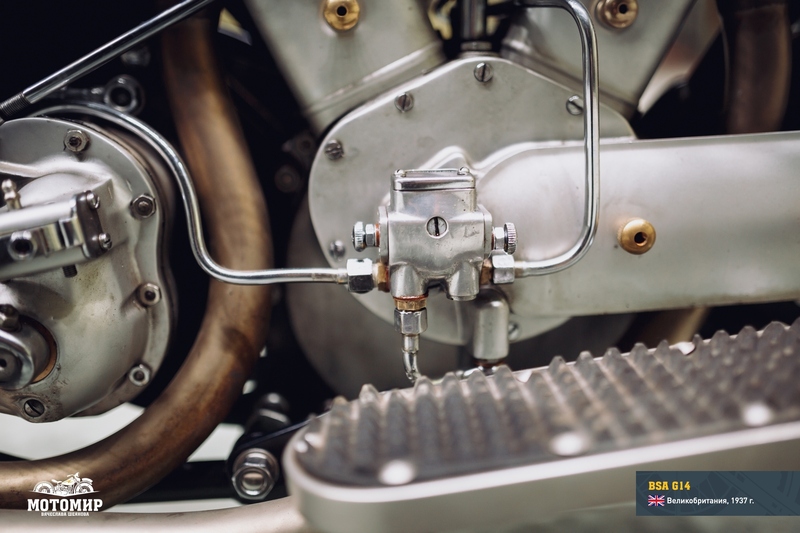 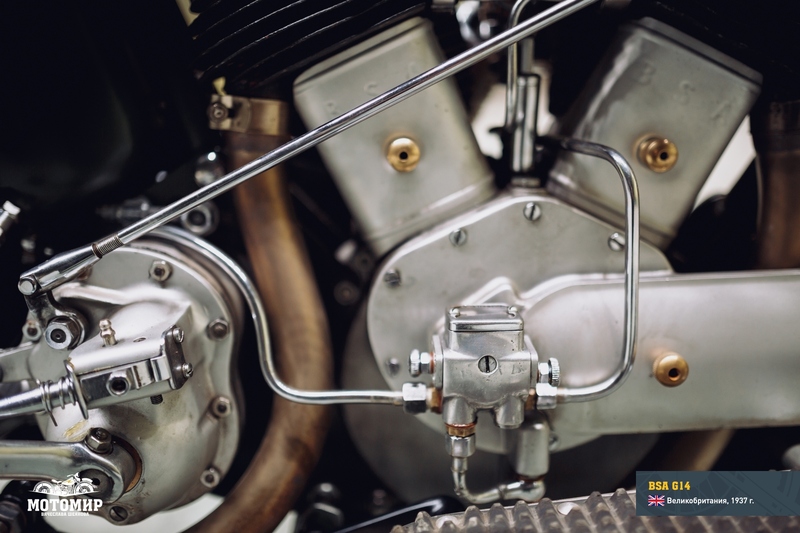 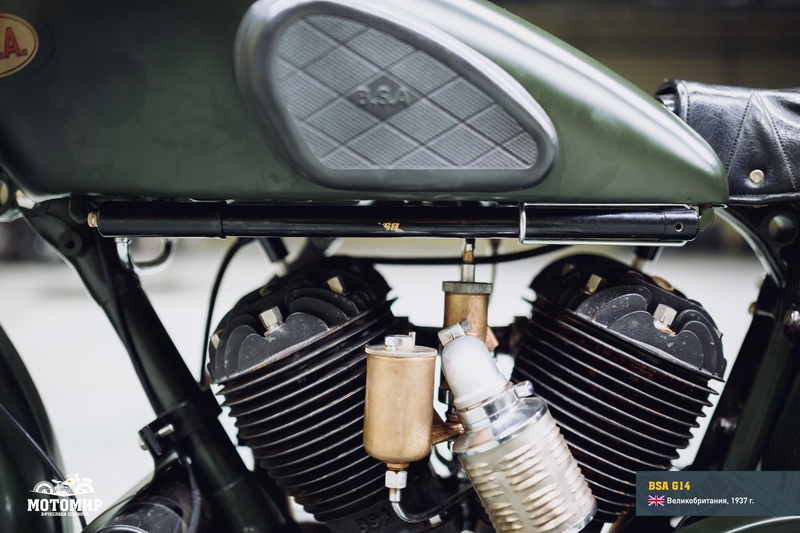 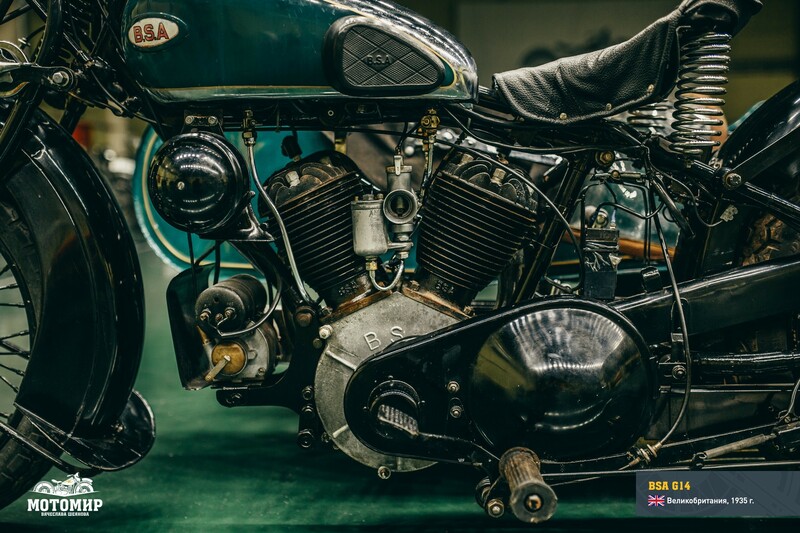 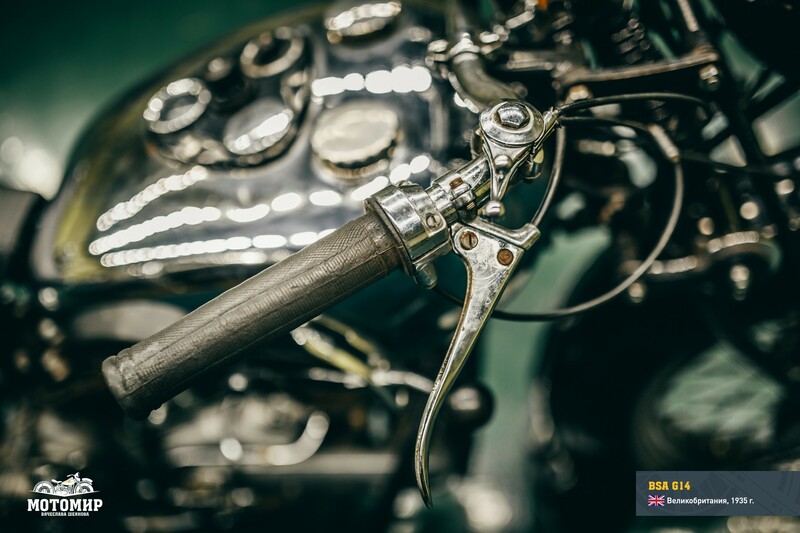 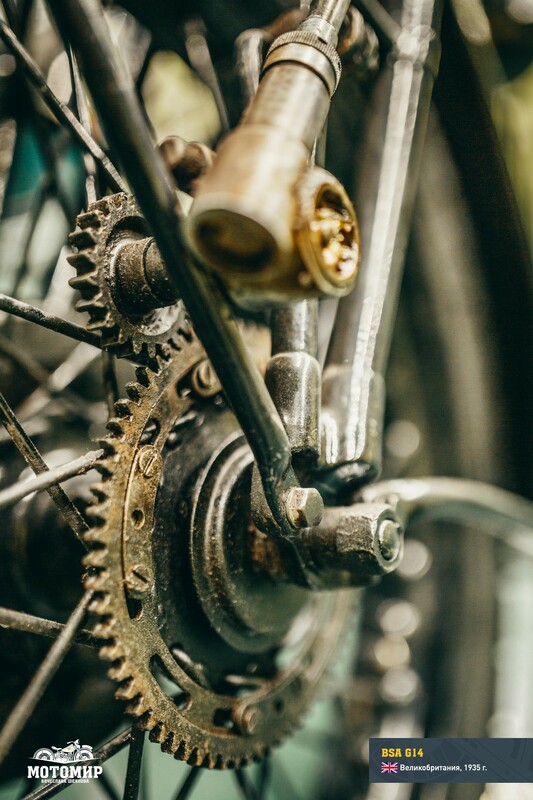 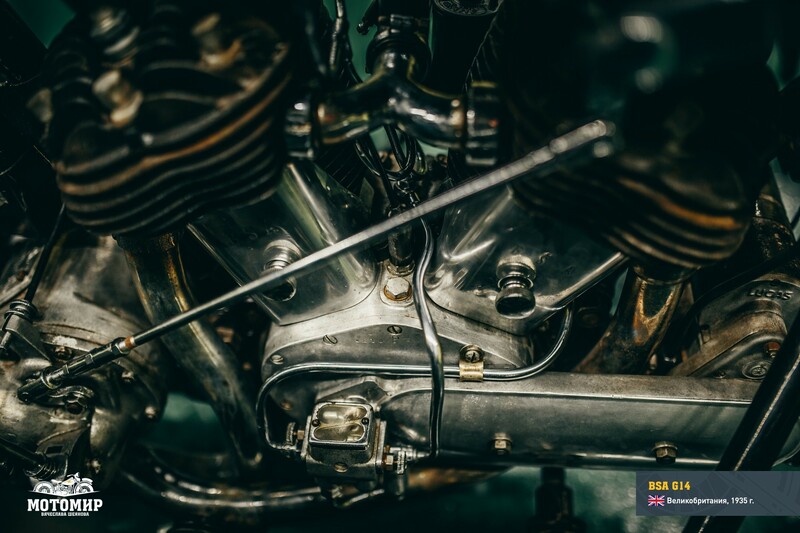 Forged steel is very rarely used in motorcycle design, with the exception of connecting rods, perhaps, even though it is well known that this solution is more reliable and solid than using molded pieces. 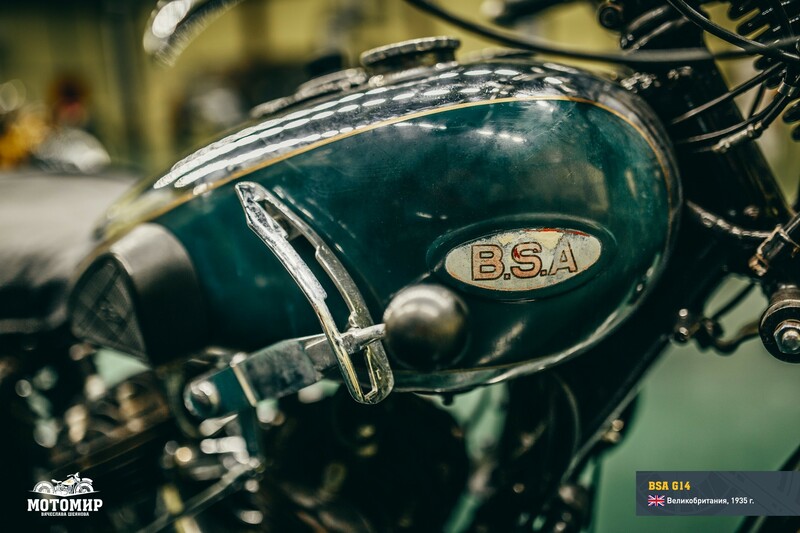 This practice was more often the case in arms production—which was, in fact, BSA’s original line of business. 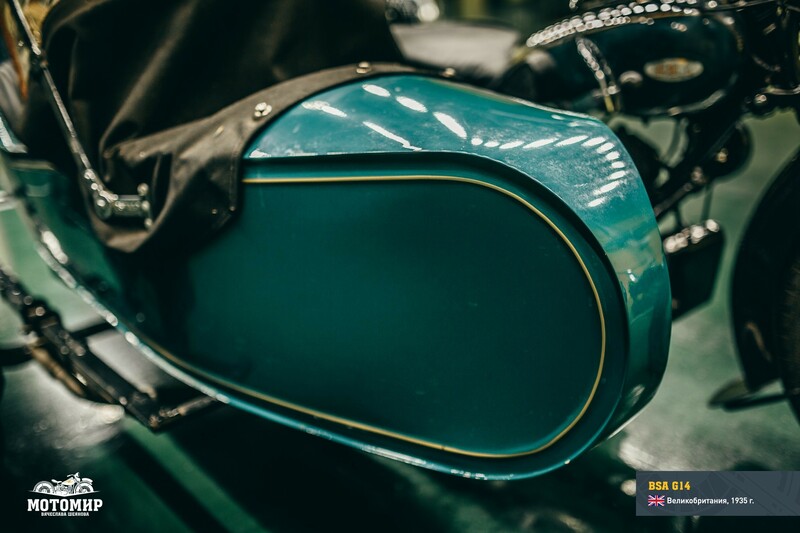 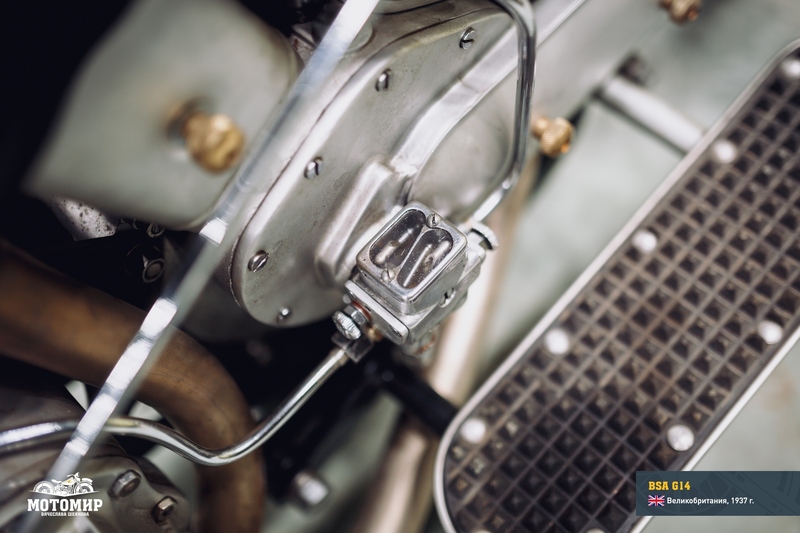 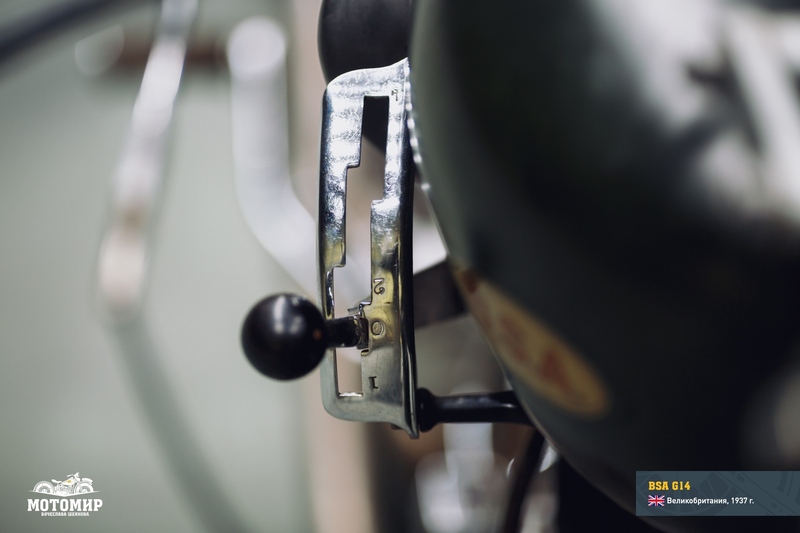 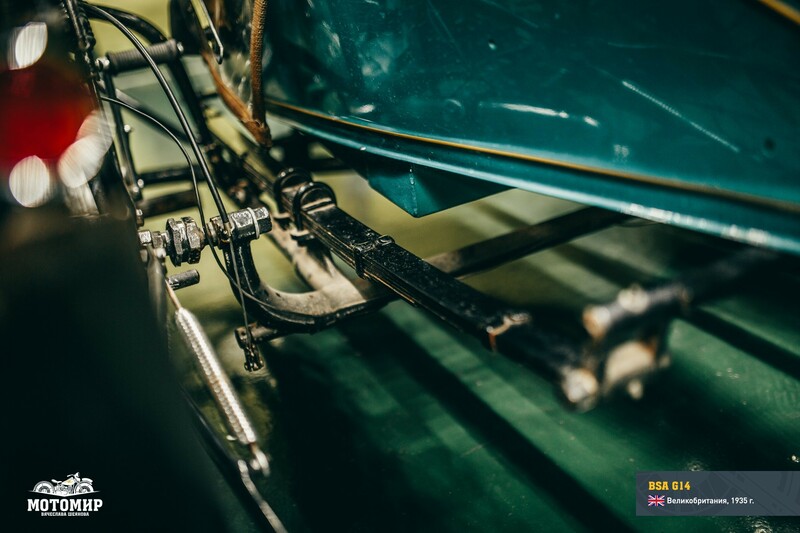 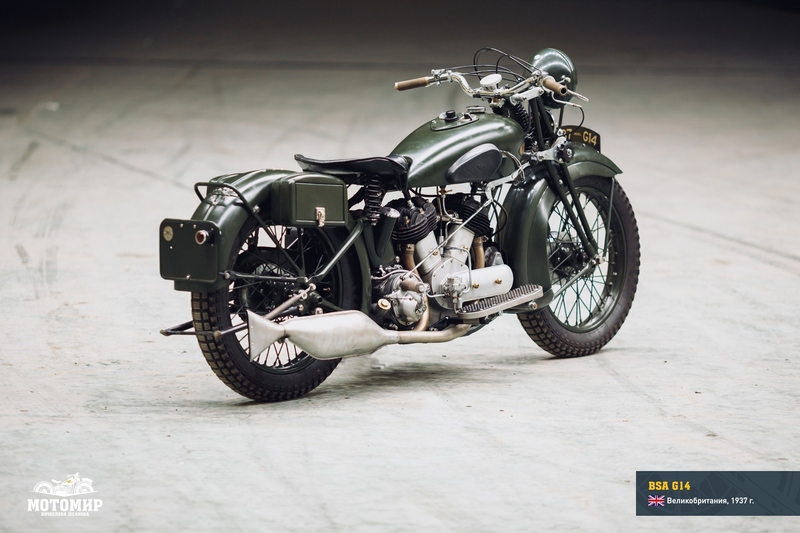 In 1937 Holland broke the contract with BMW re delivery of military motorcycles and switched to cooperation with BSA concluding one of the largest contracts over its whole history of working with foreign suppliers. 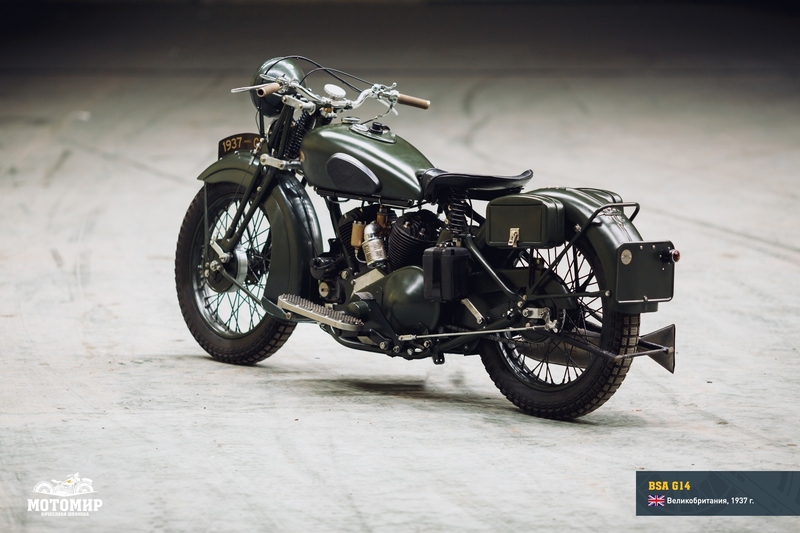 In the two years before the German occupation, the BSA delivered to the Dutch army over 1750 motorcycles—models M13 and G14. 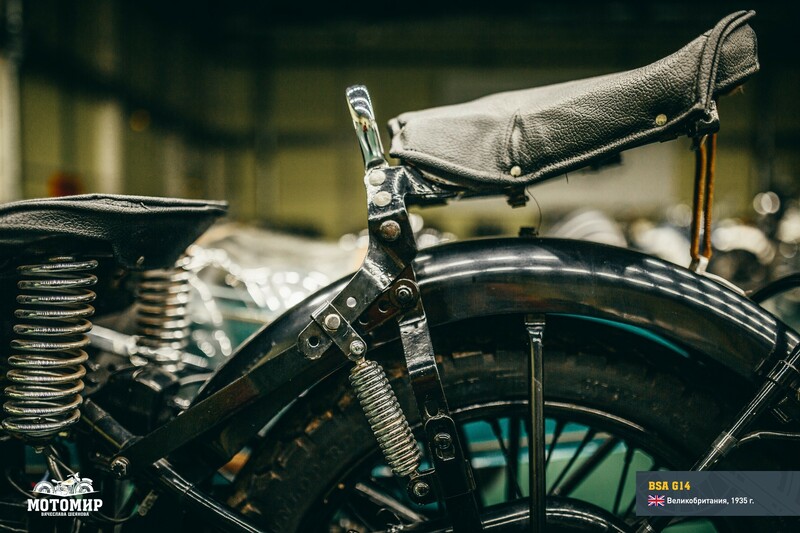 The military version of G14 was delivered in pre-WWII years not only to Holland, but also to Ireland, India, South Africa and Sweden. 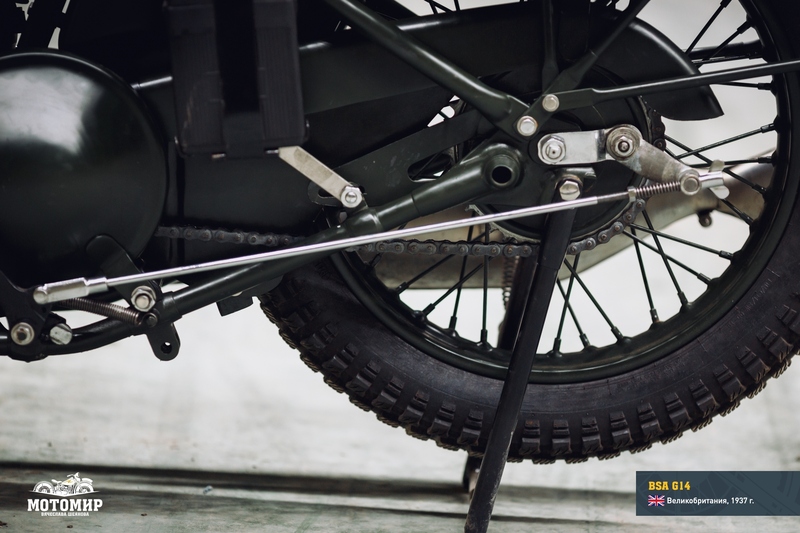 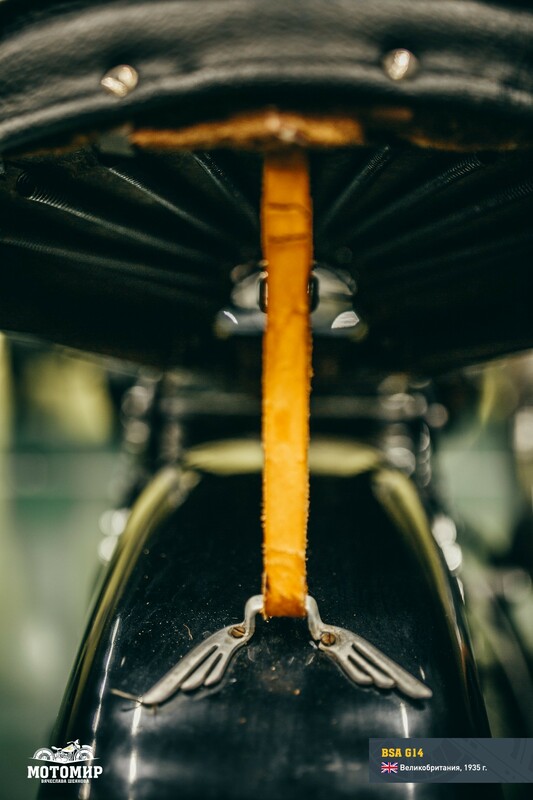 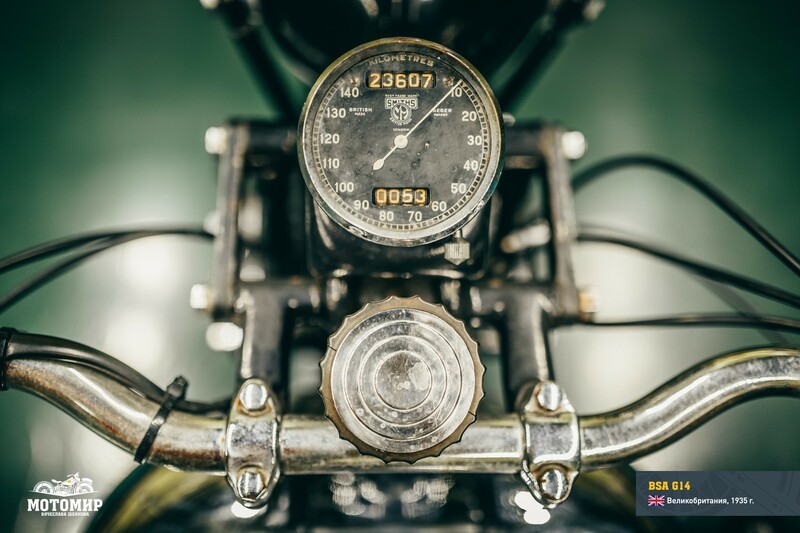 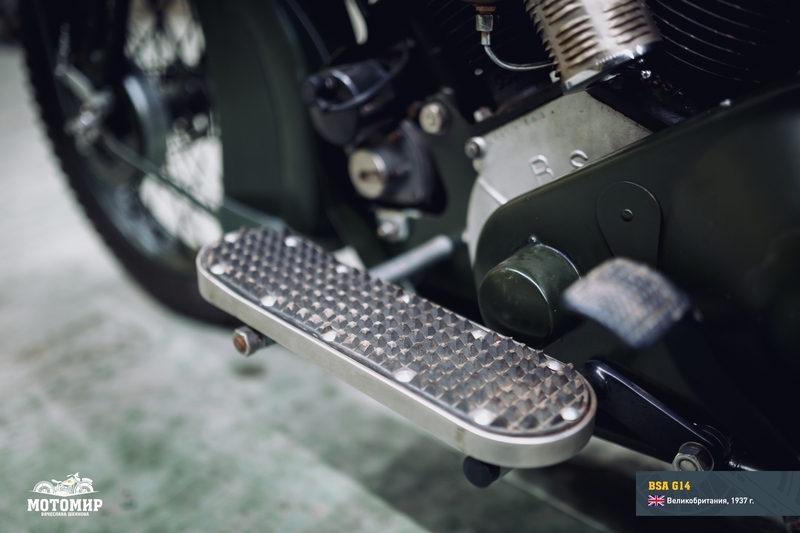 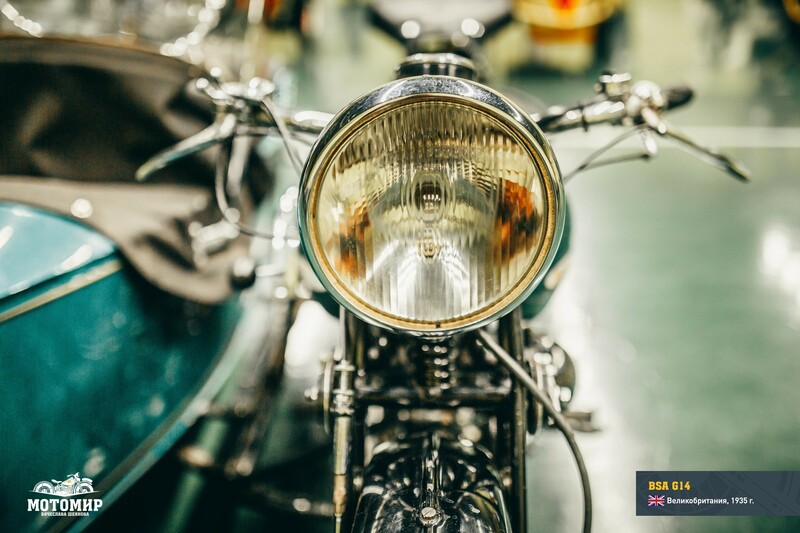 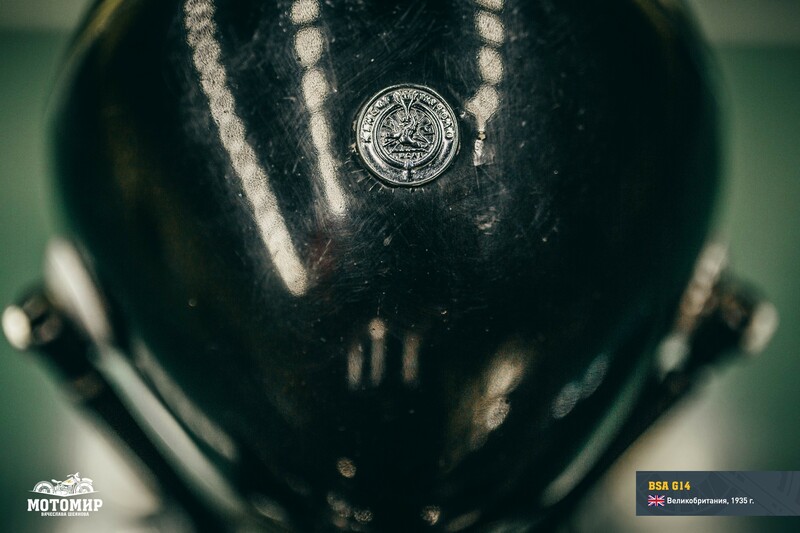 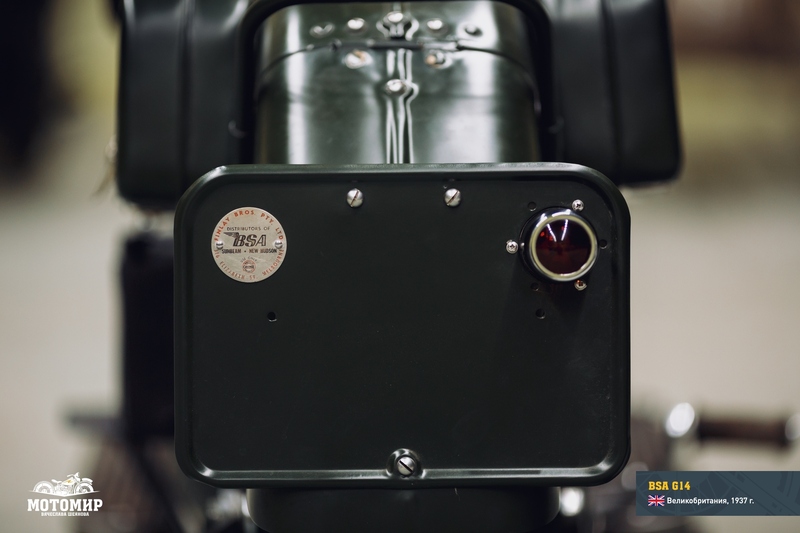 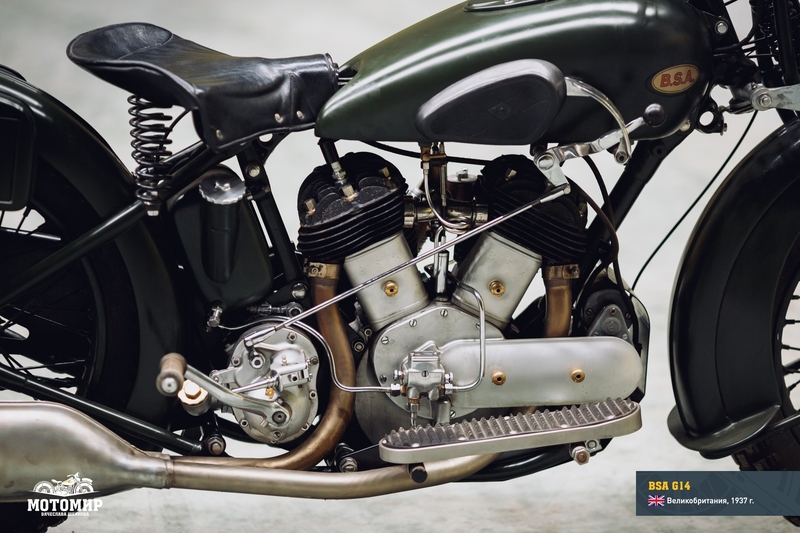 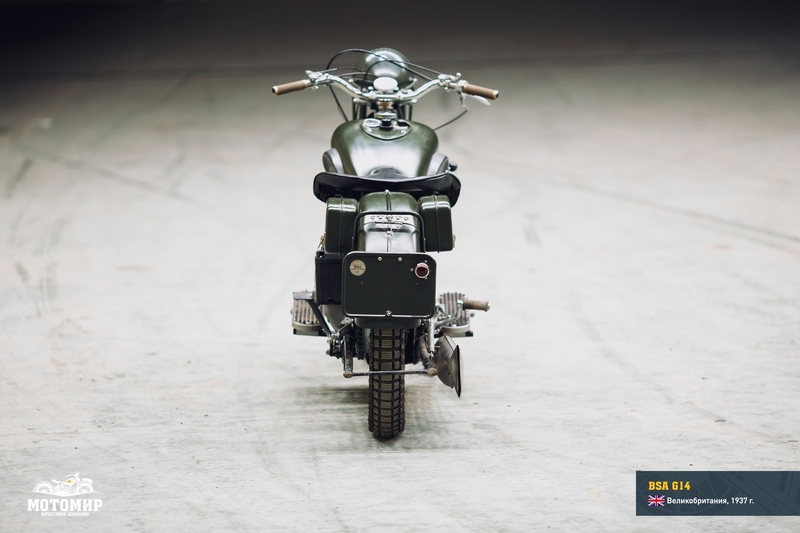 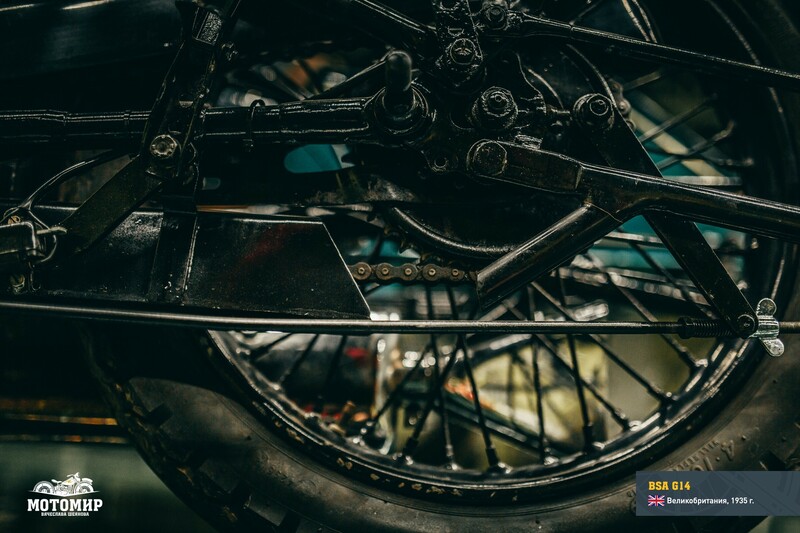 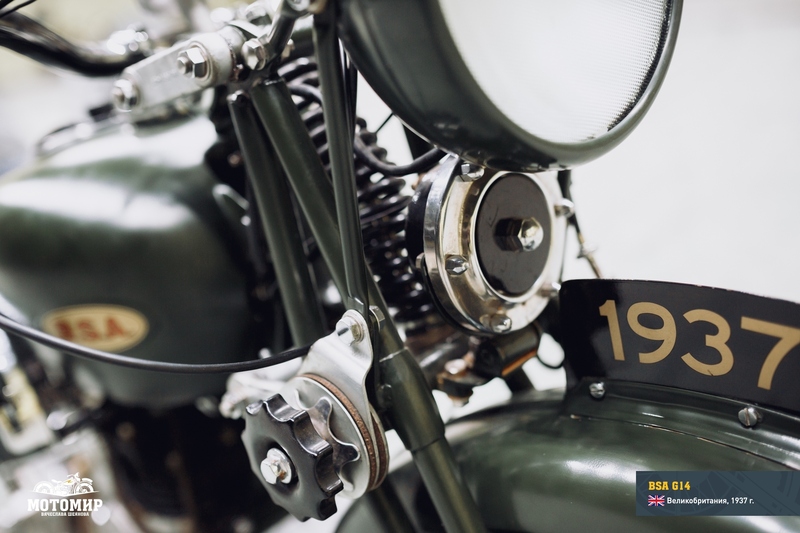 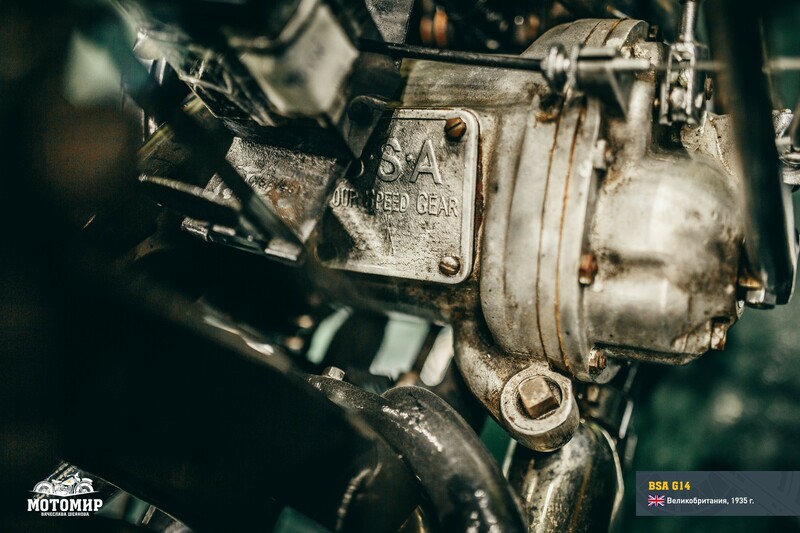 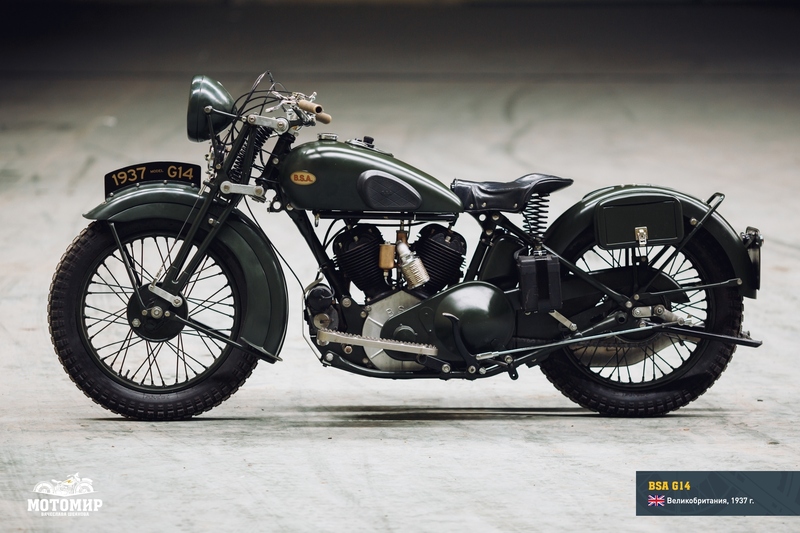 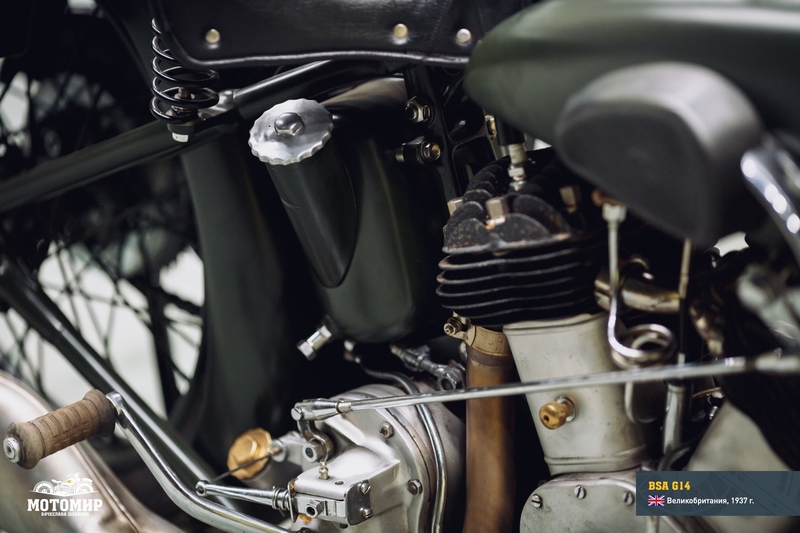 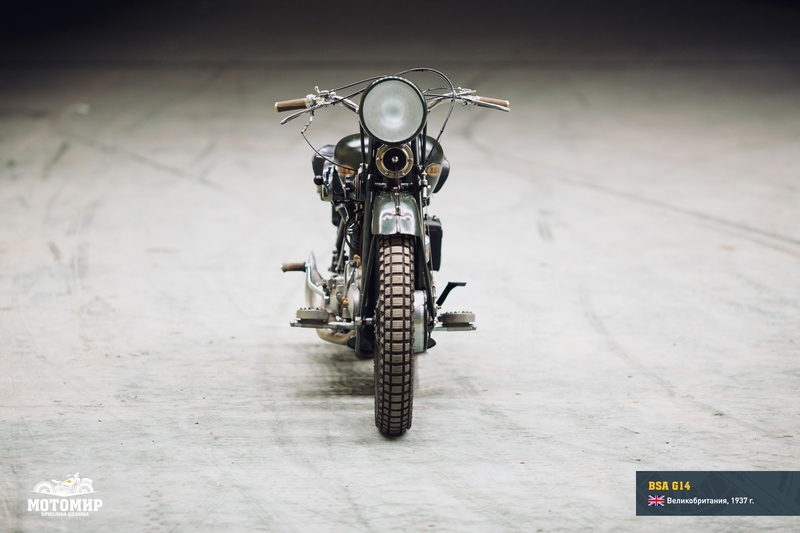 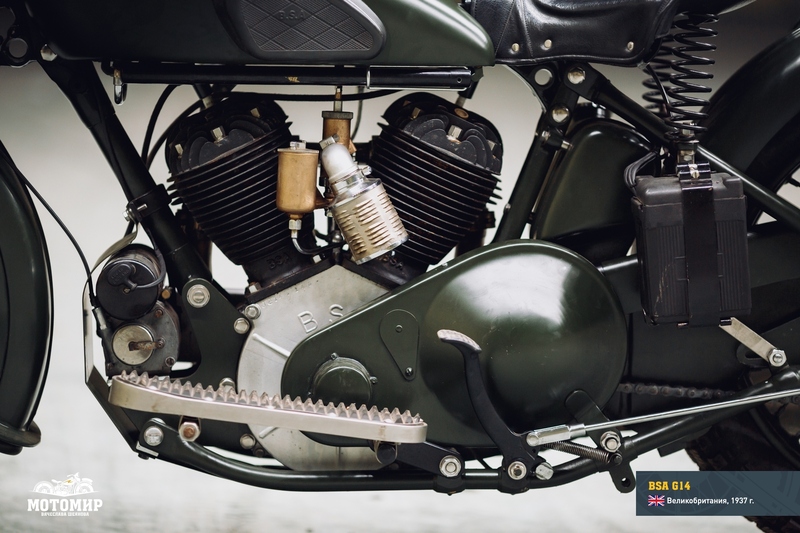 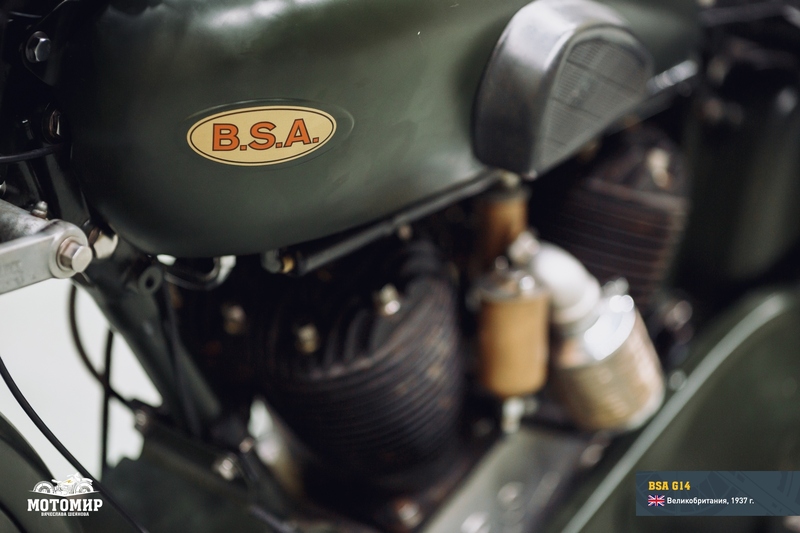 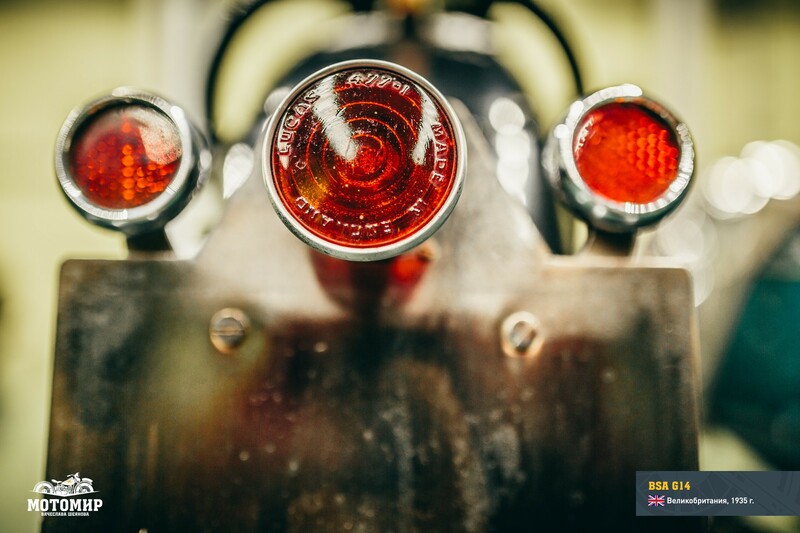 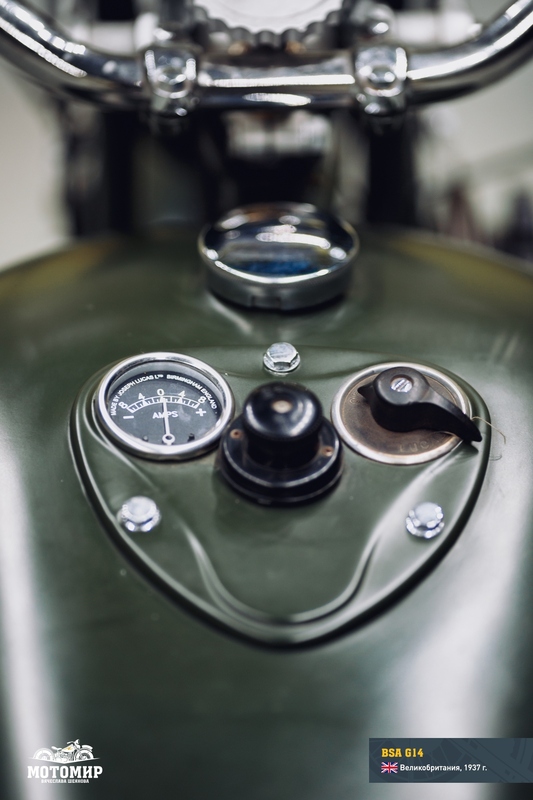 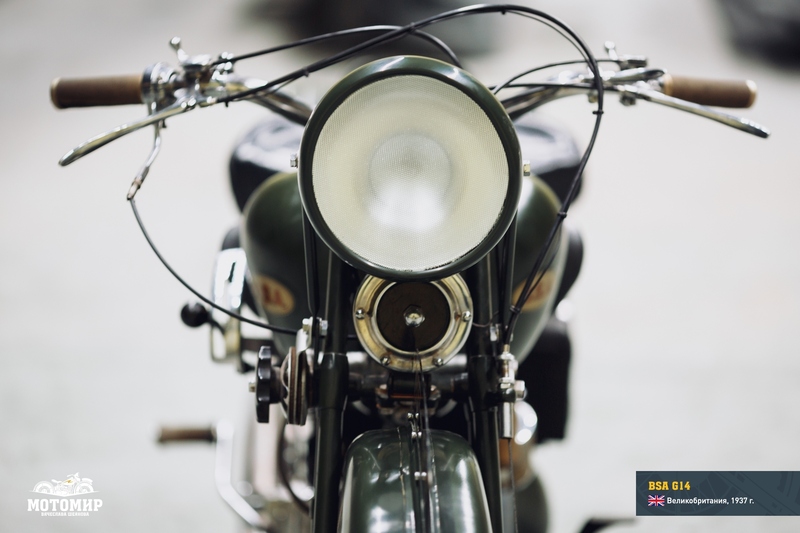 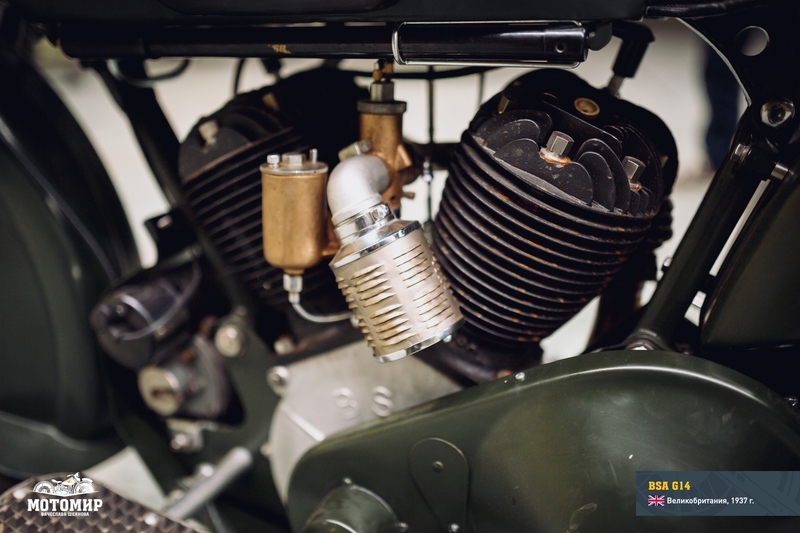 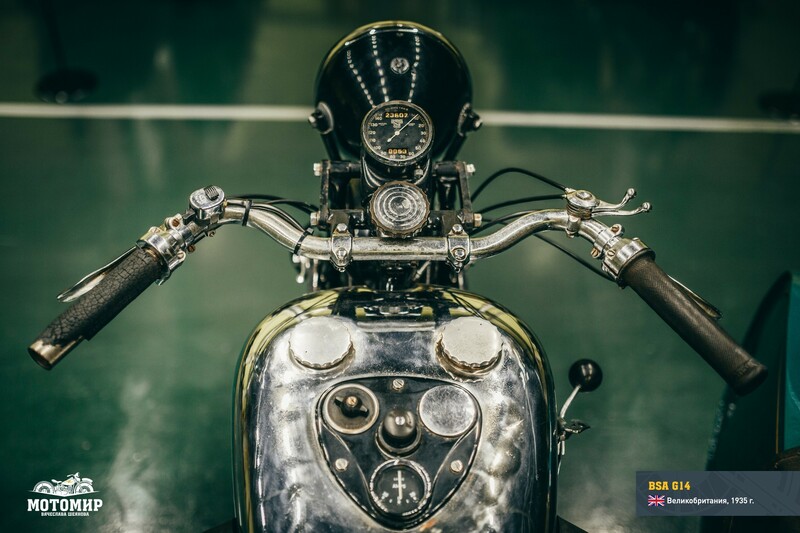 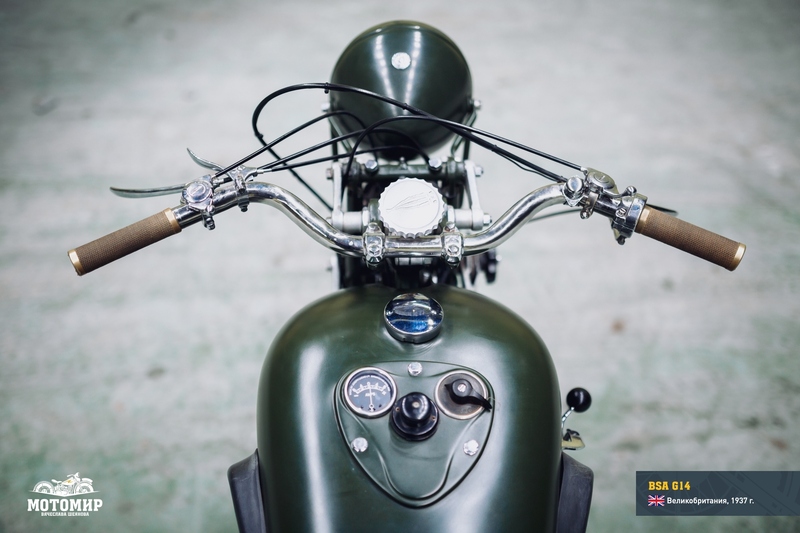 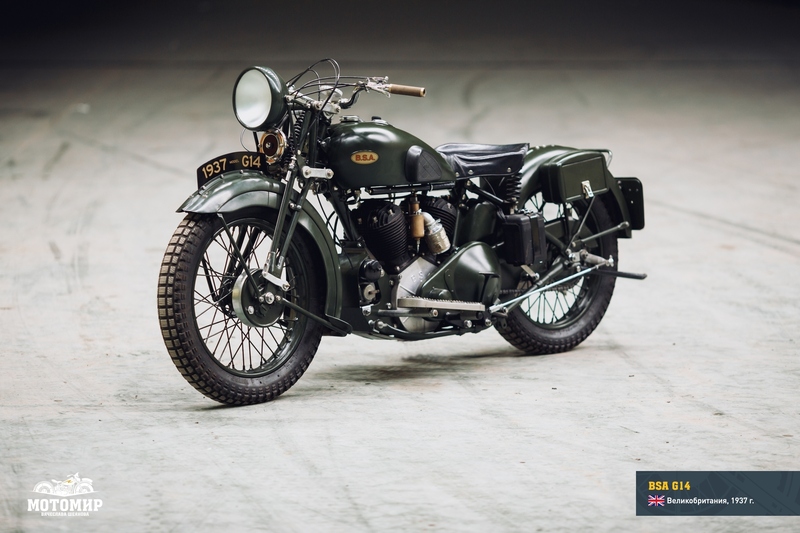 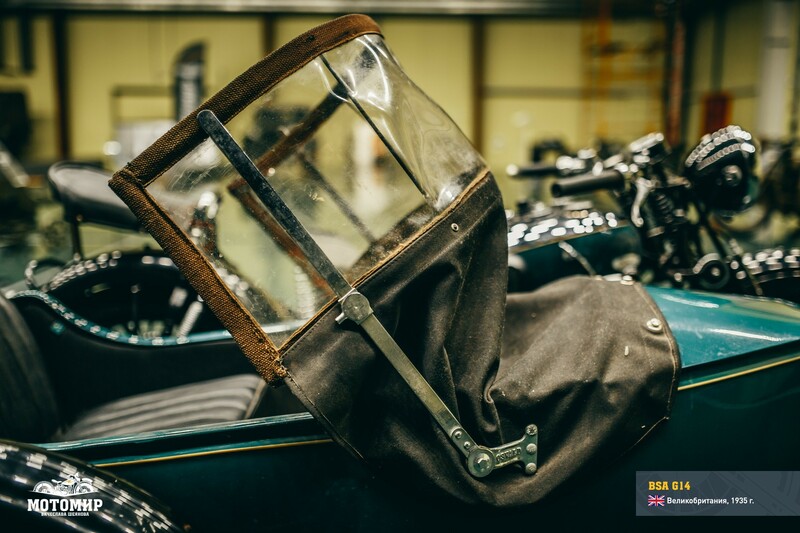 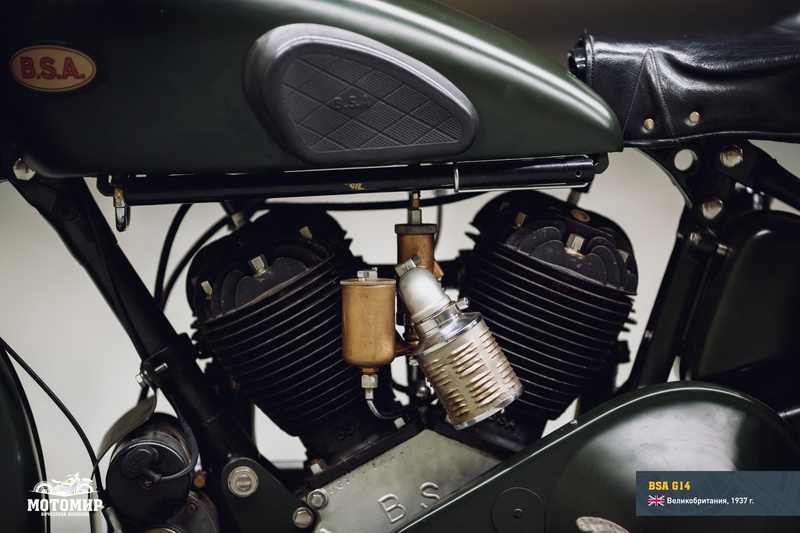 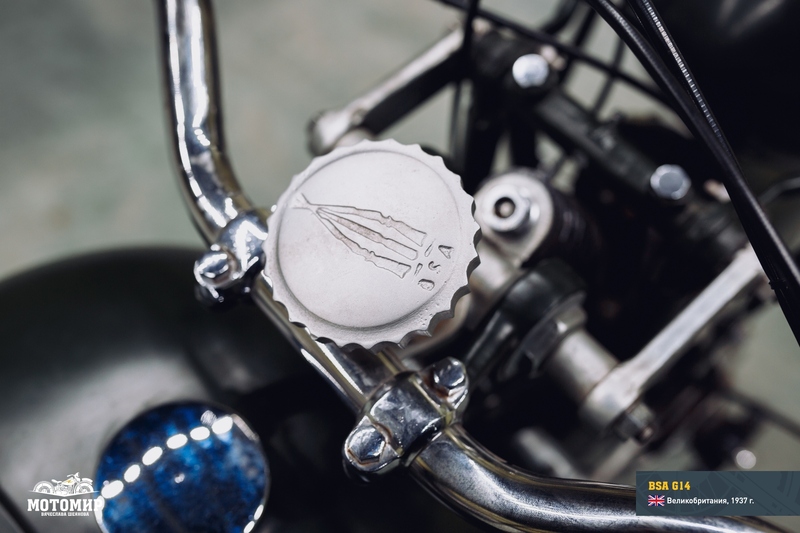 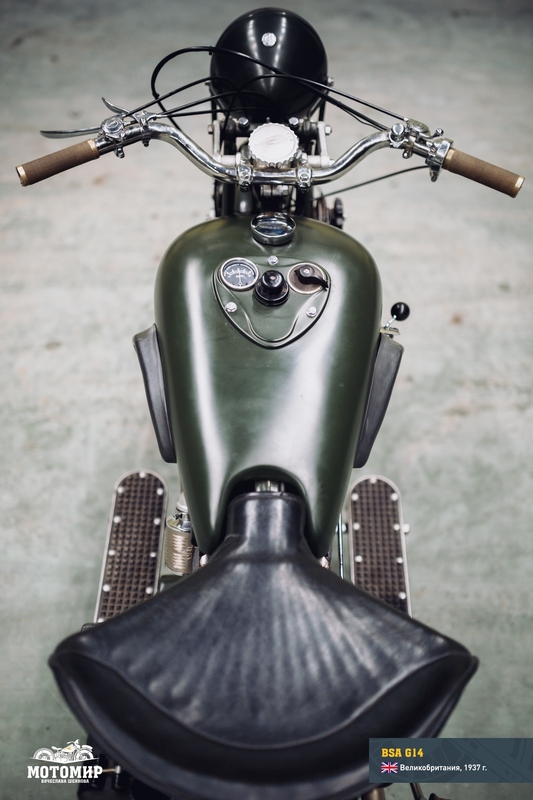 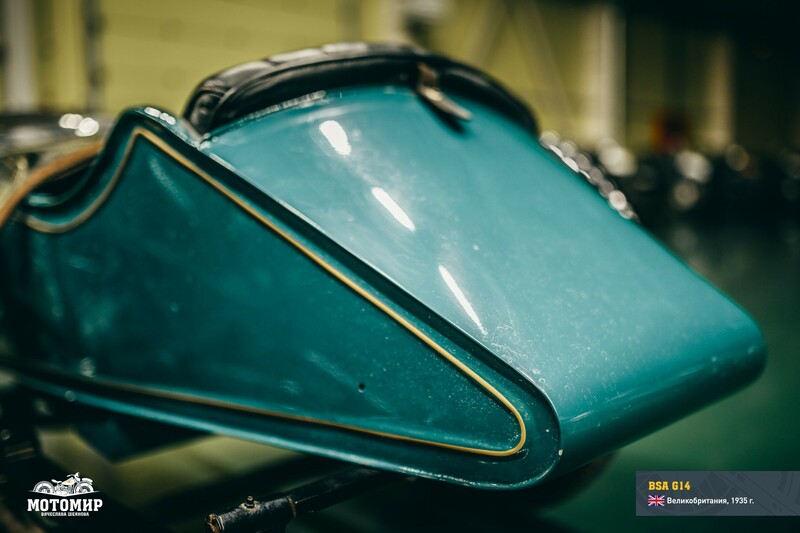 During WWII BSA was one of the largest suppliers of motorcycles to the British army. 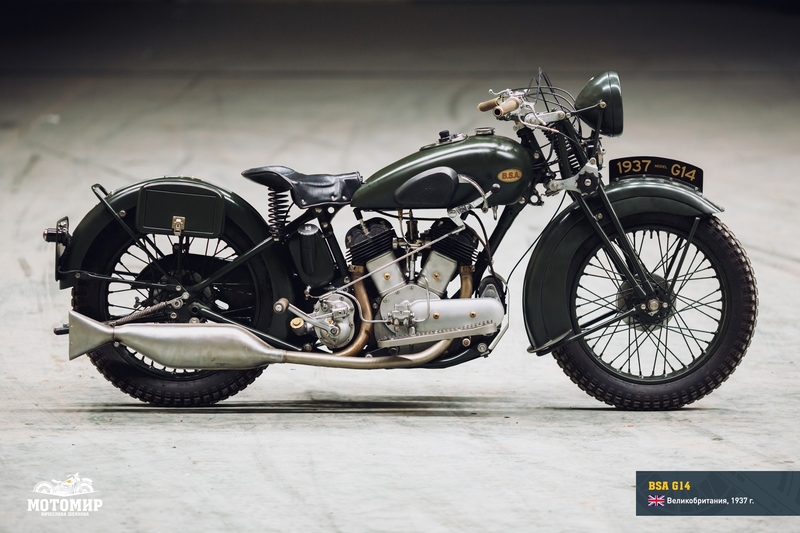 Of the 425 thousand motorcycles, the total of 126334 units was made in Birmingham. 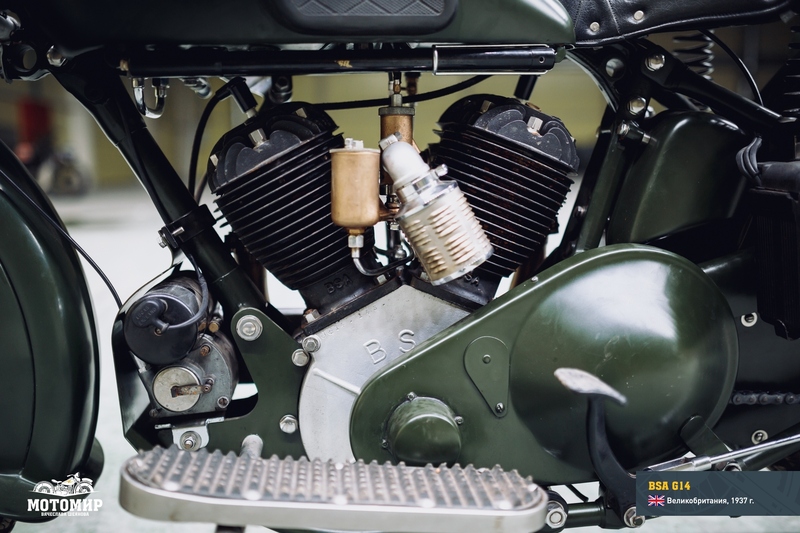 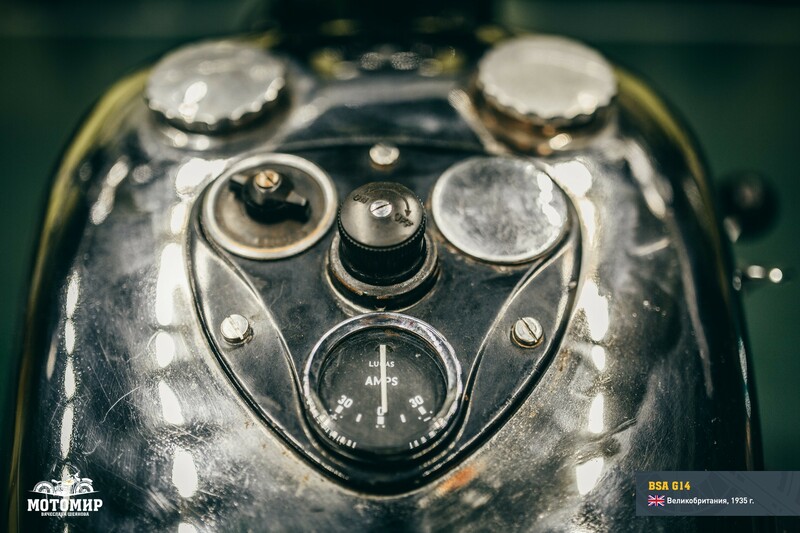 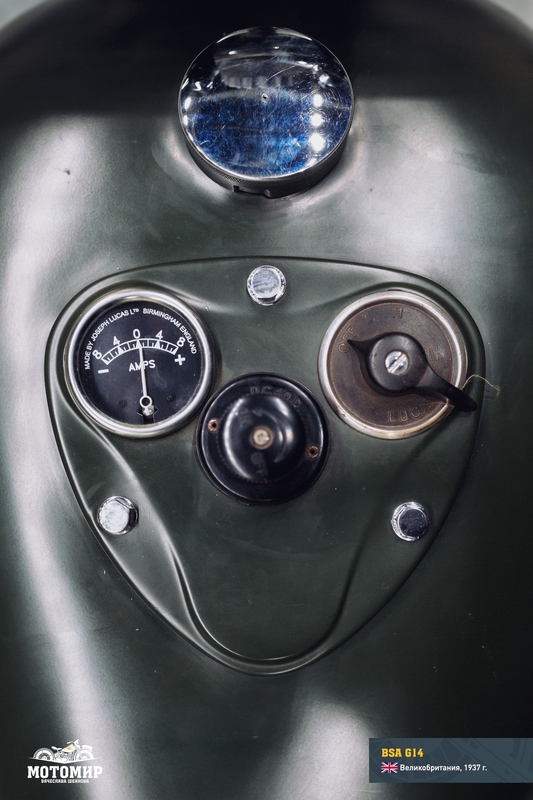 These were mostly, however, one-cylinder motorcycles that were chosen because of their lower cost and a relative ease of manufacture. 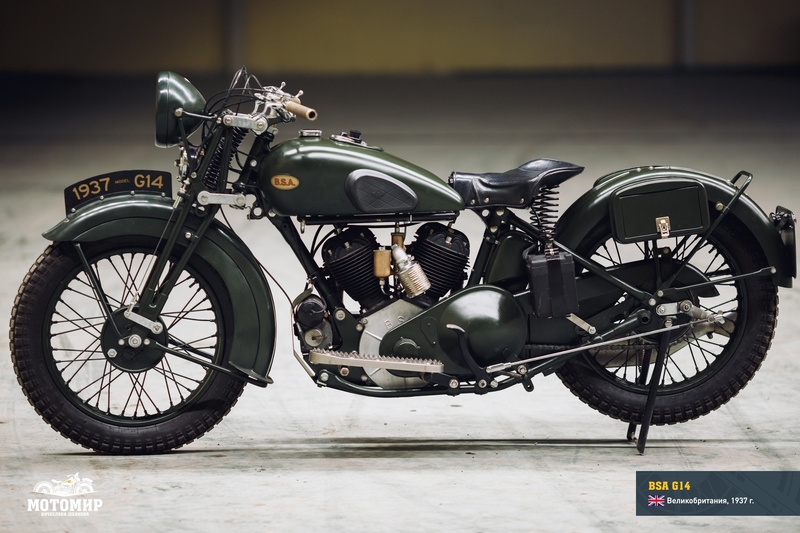 As for G14 model, its production was terminated in 1940. 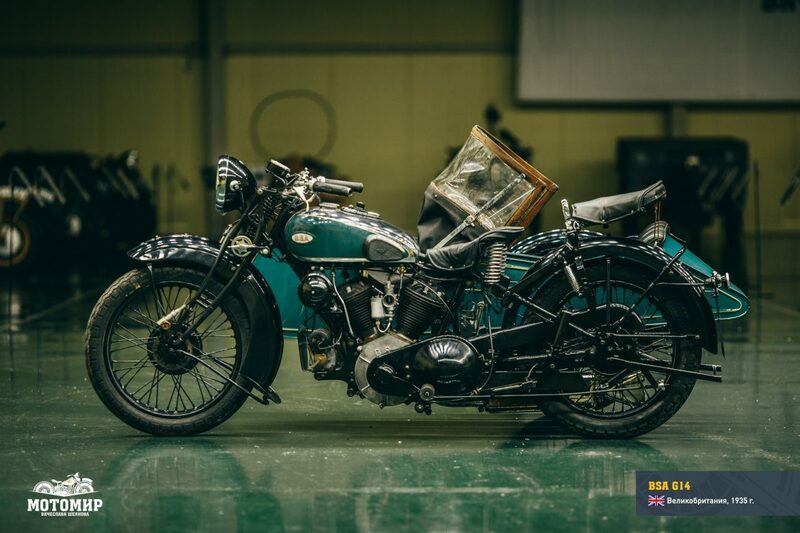 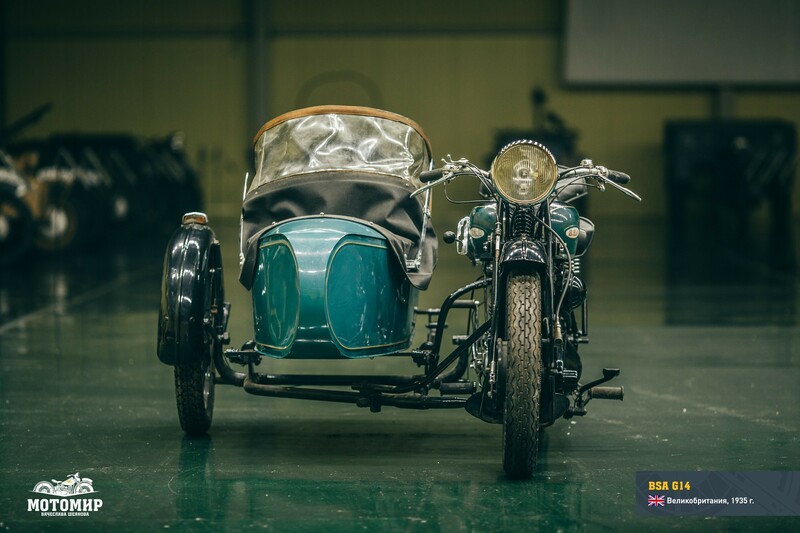 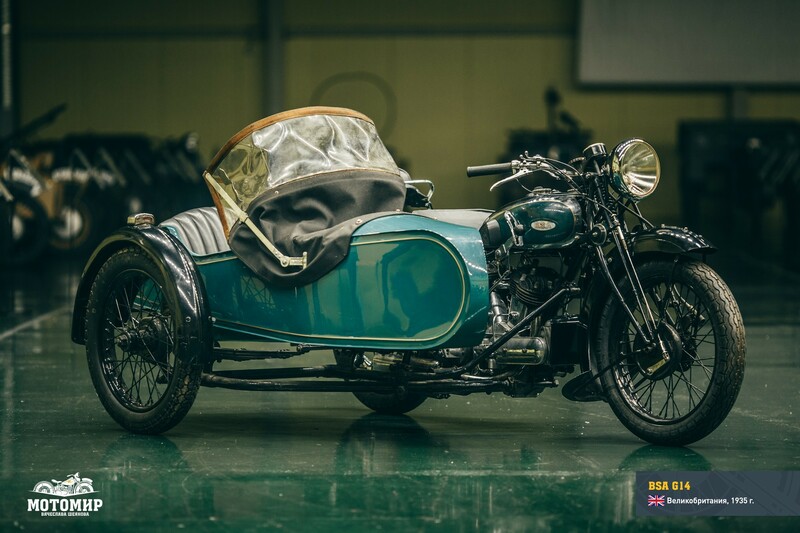 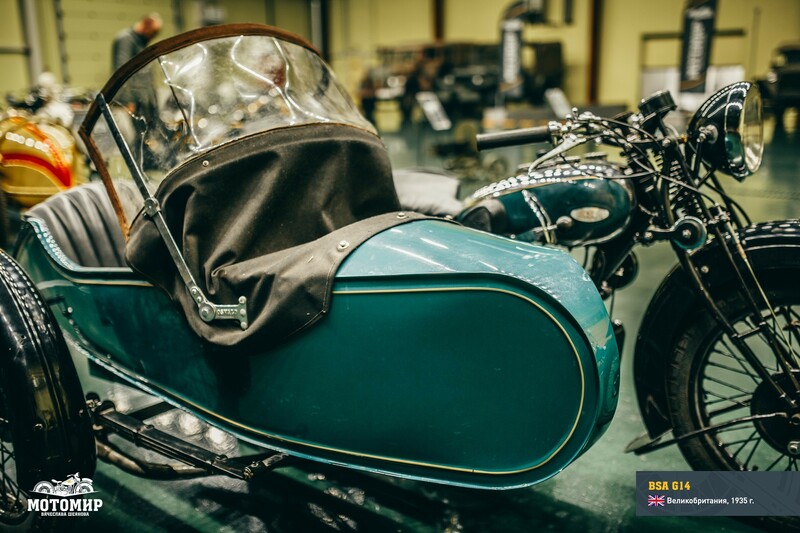 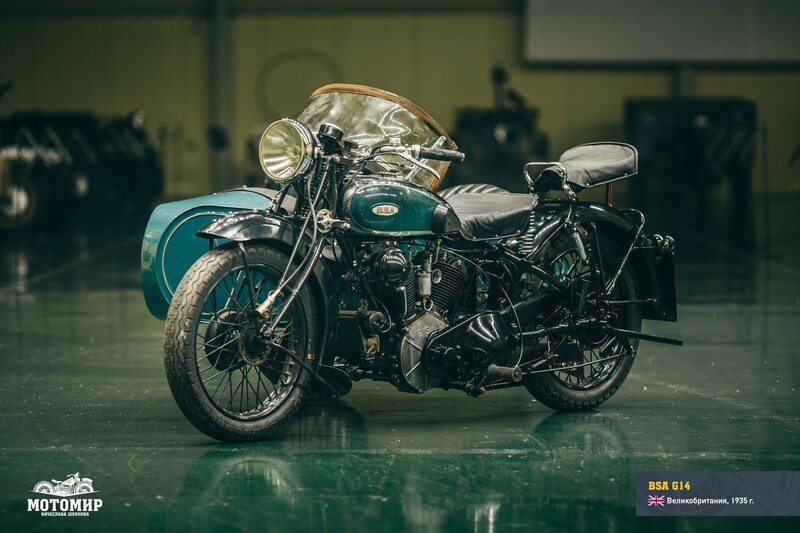 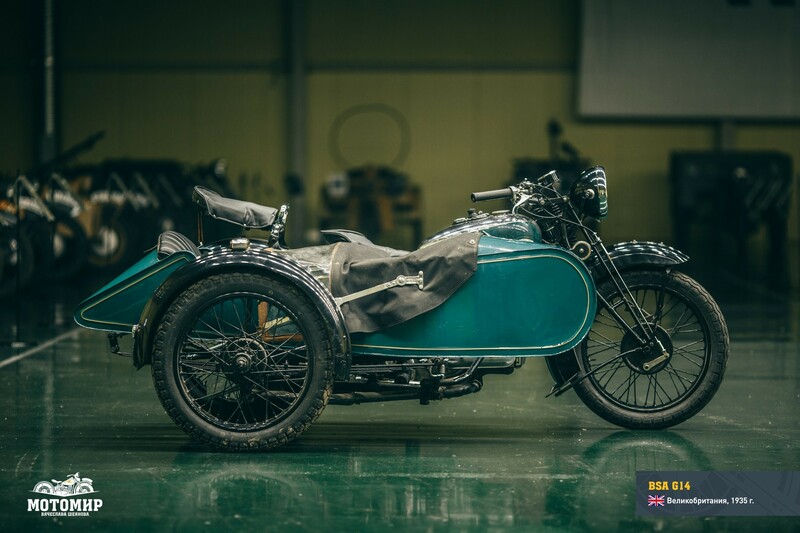 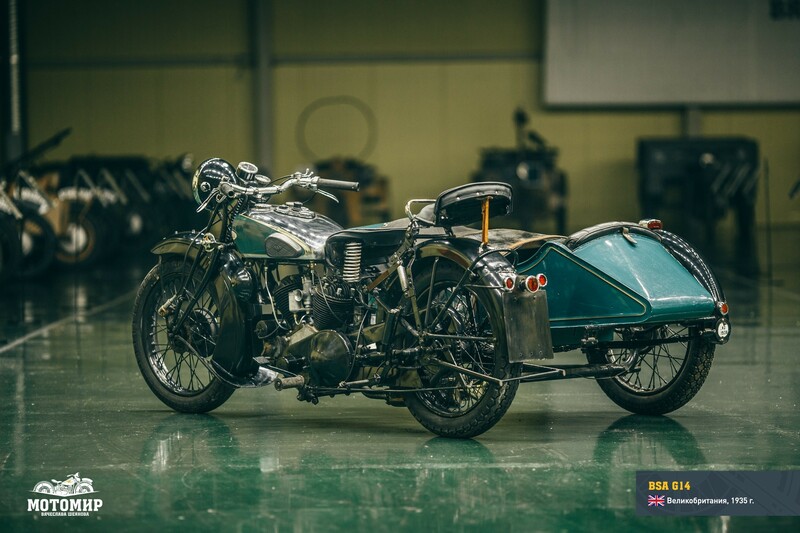 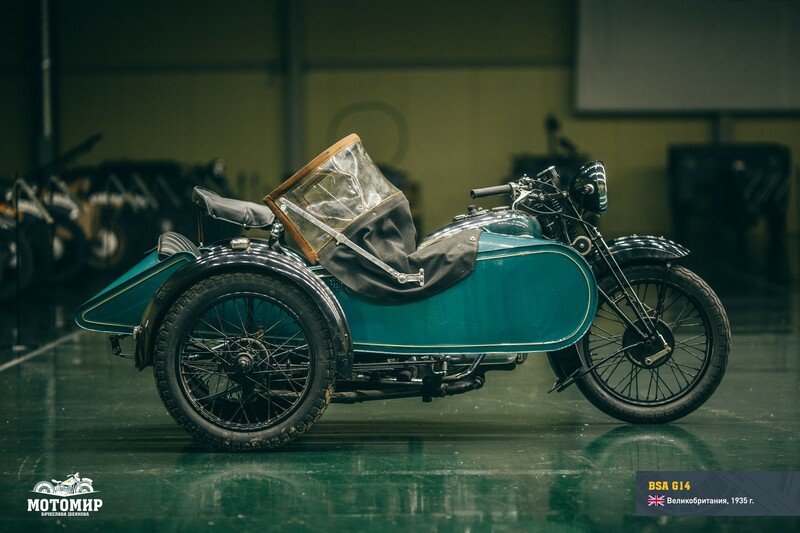 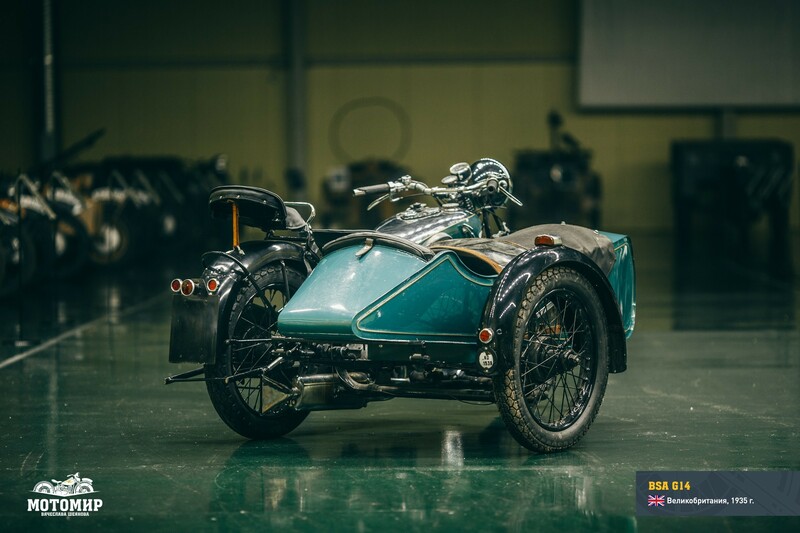 Photographs of the second copy of BSA G14 (1937) in the army version from the collection of “Motorworld by V.Sheyanov”.